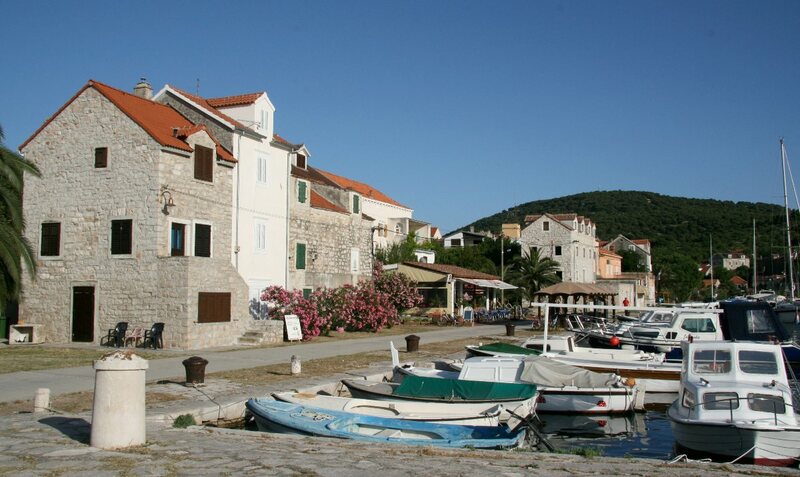 Base: Marina Kremik near Primosten, central Dalmatia. Boat: “Grazia”, Yaretti/Horizon 46, semi-displacement flybridge motor yacht with aft cabin (approx. 49 ft / 15.0m), 2x Caterpillar diesel 425hp. Flight London Heathrow to Split, arrived 15:30. Usual taxi service to Kremik marina; we stop at a supermarket en route, in Rogosniza, for catering. After check-in and yacht briefing we get the taxi to Rogosniza, restaurant Atrium, and have very nice first fish dinner. The weather is hot, about 30deg C; forecast to get even warmer the next day; SE winds 3-4 during day. I register the crew at the marina reception (Kn5/£0.58 p.p. ), we do some catering in the marina market, and have the air-conditioning system fixed (a blockage of the cooling water filter had stopped it working). 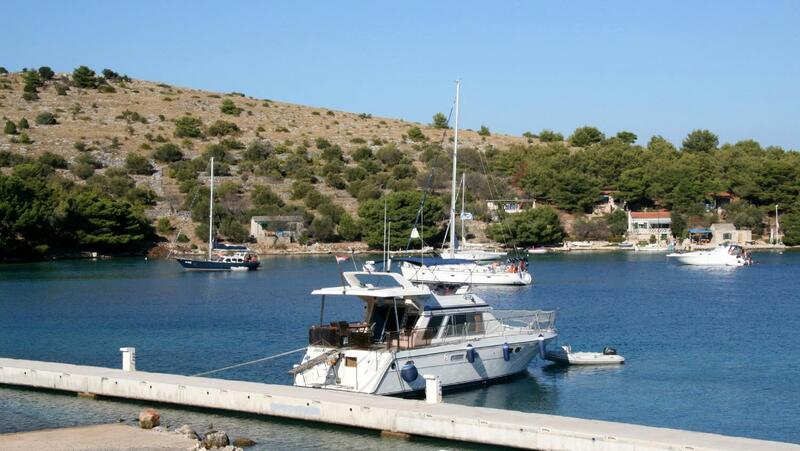 We leave berth at midday and head for Lojena cove on Smokvica island in the Kornati. The SE wind has got up but does not impact us much. 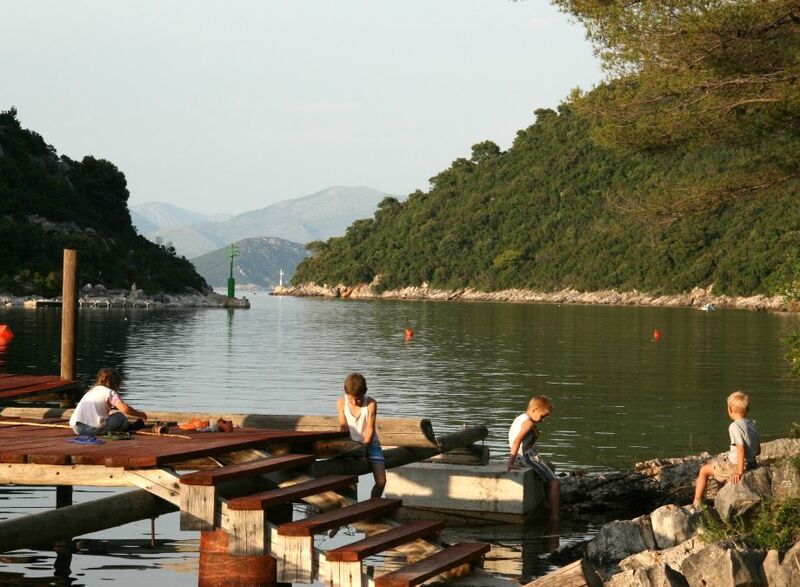 In Lojena we choose restaurant Piccolo, where we are directed to go alongside the small quay. This feels a bit scary due to its low level and rough rocks sticking out underneath. The restaurant boy -who doubles as berthing helper- is adamant to pull the boat along the quay instead of securing our ropes first, causing further concern. Anyhow, Piccolo proves a good choice; we have fish dinner with skarpina one of our favourites; the quiet balmy night invites for a late swim, a true treat. 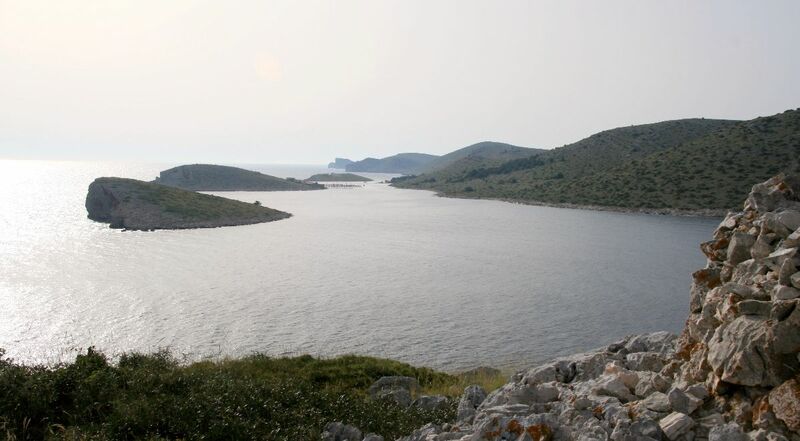 A short walk up the path, which starts near Mare restaurant, offers amazing views of the Kornati channel to the NW and around. 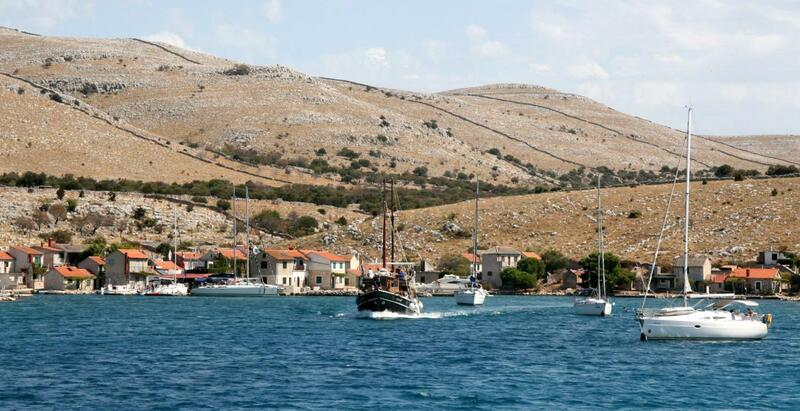 We leave berth and cruise into the Kornati, passing Opat, and along Kornat island. 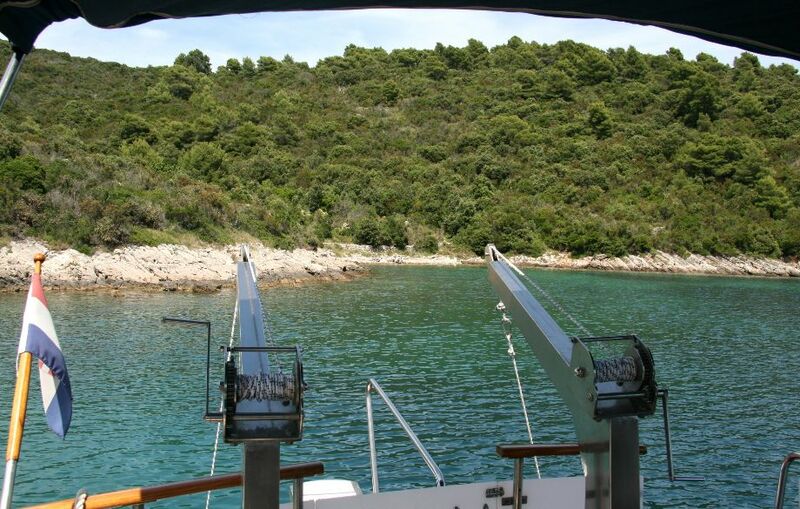 Lunch stop at Vrulje cove, anchored in the E part of the cove protected from the NW. 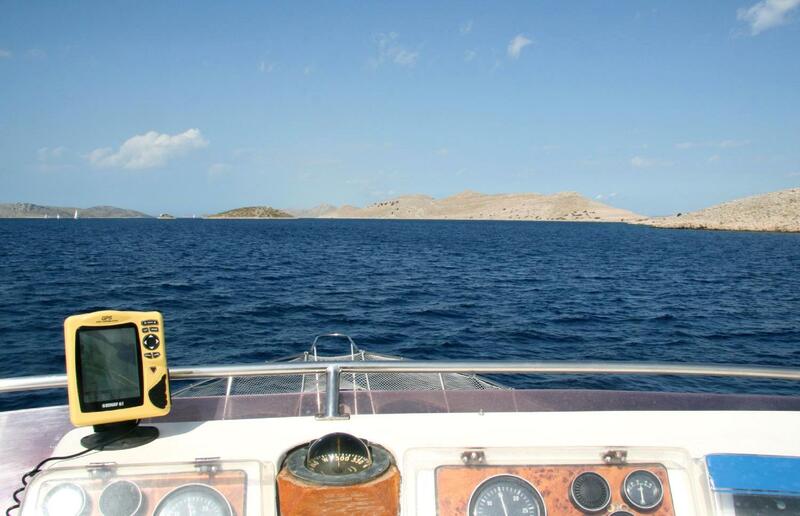 Later in the afternoon we continue NW through the Kornati channel, past Silo island, and have a look into Telascica bay on Dugi Otok. This includes a tour of the popular Mir cove. 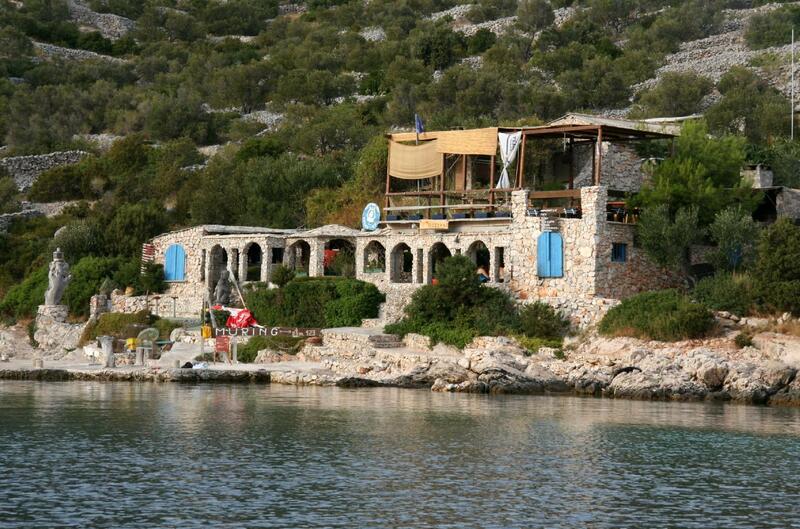 Finally, we make for restaurant Aquarius in the N of small Katina island, directly overlooking Mala Proversa passage. We had expected that there would be buoys in the small cove opposite the Aquarius restaurant as in the past, but there aren't any. 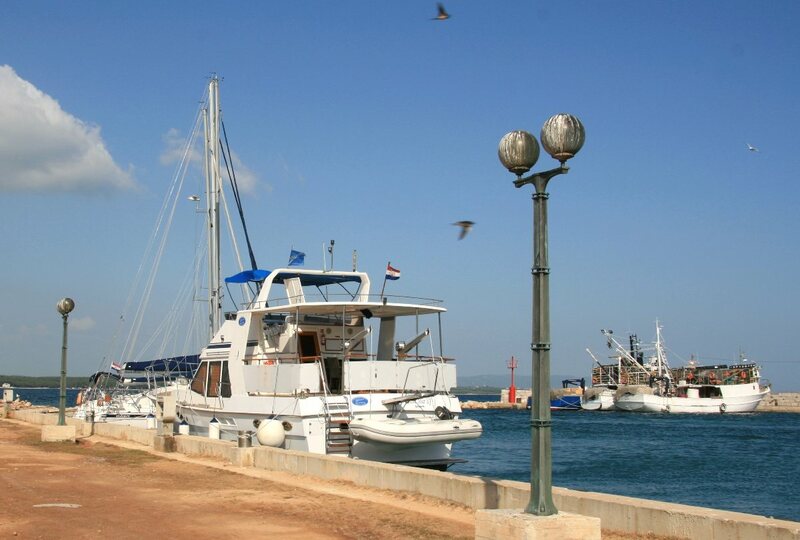 There is space on the inner part of the small jetty; but the presence of a catamaran moored alongside the short quay makes access difficult. Adverse wind from NW does not help! Somehow we squeeze past and moor with the assistance of the restaurant owner along the ragged wall, all without causing scratches on the boat. We have a good meal, and hear from our host, Zoran, that he had just removed the buoys, in reaction to his neighbour who had started an illegal makeshift restaurant next to his, and was enticing customers moored on Aquarius’ buoys away and to his (still crappy) place. We wish Zoran best of luck with his restaurant and feel disturbed that rough unethical people and practices appeared on these idyllic bare islands where business is not easy anyway. The weather is completely clear, starting with a bright and calm morning; some NW of 3-4 bf getting up during the day. Our plan is to anchor in a cove on nearby Zut island during midday and go to one of the restaurants in Zut cove over night. 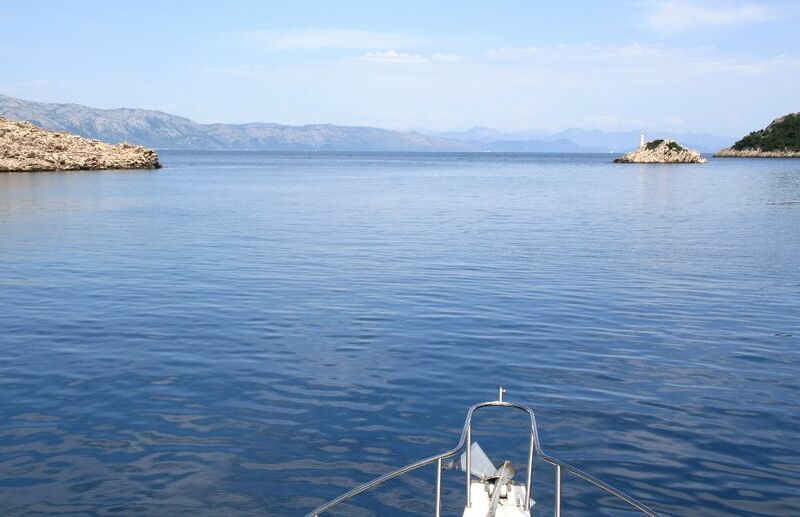 We anchor in the bare small Bodovac cove where the wind seems to come from WSW whilst outside it is NW. I notice that the voltage of the engine starter batteries is showing low, apparently not being charged by the alternator, also the corresponding control light is out. I try to call the base to discuss but there is insufficient mobile network coverage inside the cove. So we leave for Zut marina (ACI) on the other side of the island where we expect to be able to use our mobiles and be better positioned in case we should need help. The base confirms the alternator could be the issue; I will monitor it and, anyway, charge the batteries from mains power or generator. We spend the afternoon in brilliant sunshine in the pleasant Zut cove with sunbathing and swimming. Later we explore the large bay by dinghy; followed by reasonable dinner at the marina restaurant (its design reminds us of Piskera marina). It feels like late in the season, only few boats on the long marina pontoon, although weather and sea temperature could not be any better. The forecast for the next couple of days is again for fine and warm weather. 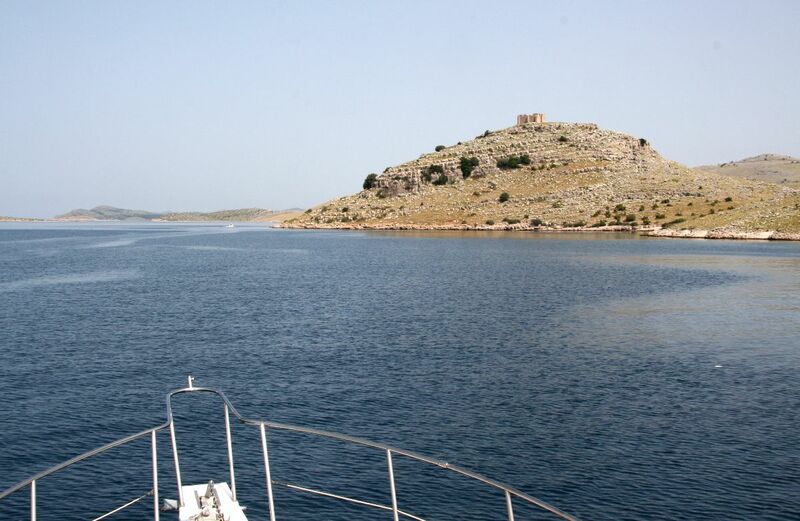 We leave Zut by 10am and cruise in calm seas towards Murter island, passing Vrgada en route. The ladies enjoy sunbathing on the front deck. The boat feels comfortable and quiet at 9 kn, although capable of up to 18kn when pushed, creating a large bow wave. We prefer the relaxed and fuel saving displacement speed. 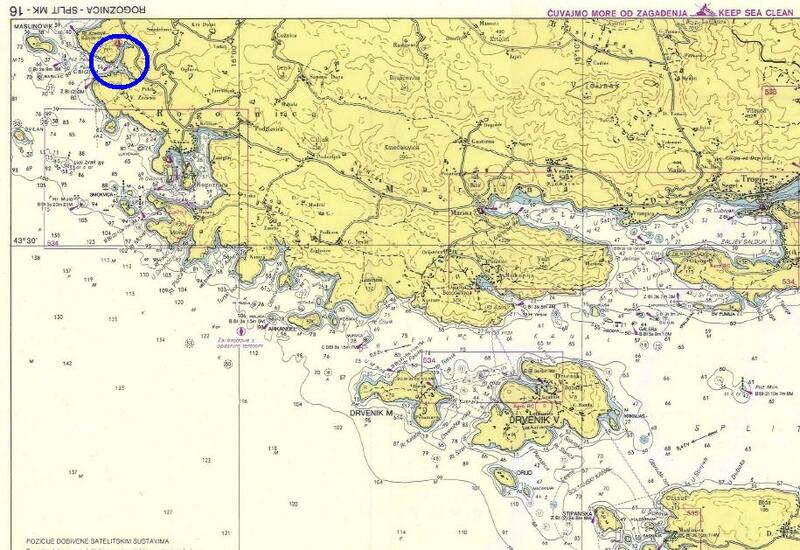 Along the West coast of Murter island, the small cove of Vucigrade is mostly blocked for yachts by swimming area markers, with just 2 buoys for small yachts left in the centre. 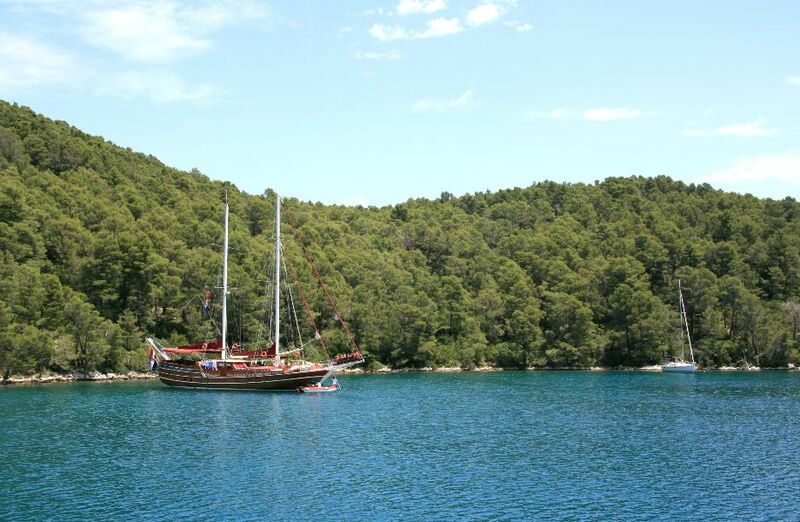 We proceed to Kosirina, a much larger cove, and anchor at 6m in front of the beach and camping site. Sandy ground and good holding. 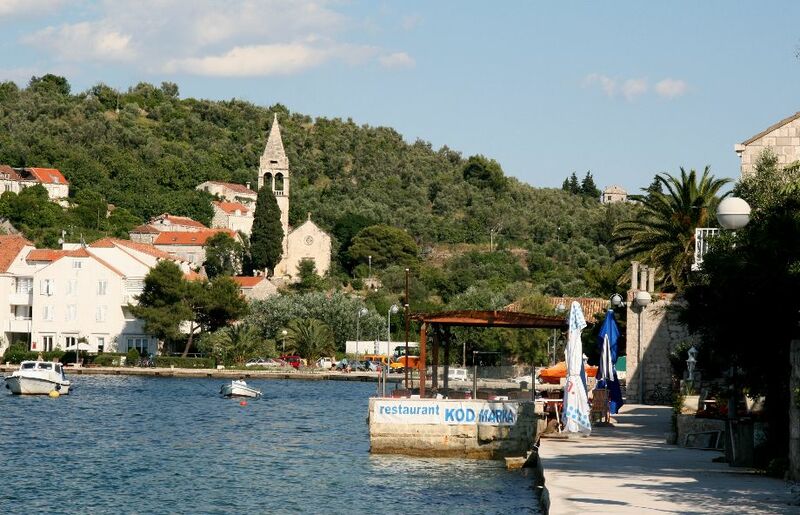 Swimming is good; at 3 pm we decide to leave for Tribunj marina, to explore the old town and tourist resort. When using the deck-shower a corroded mixer tap disintegrates, causing hot water to splash out: No way to turn it off other than by switching off the domestic water pump; this means no water nor working toilets on board(! ); a solution is needed urgently. 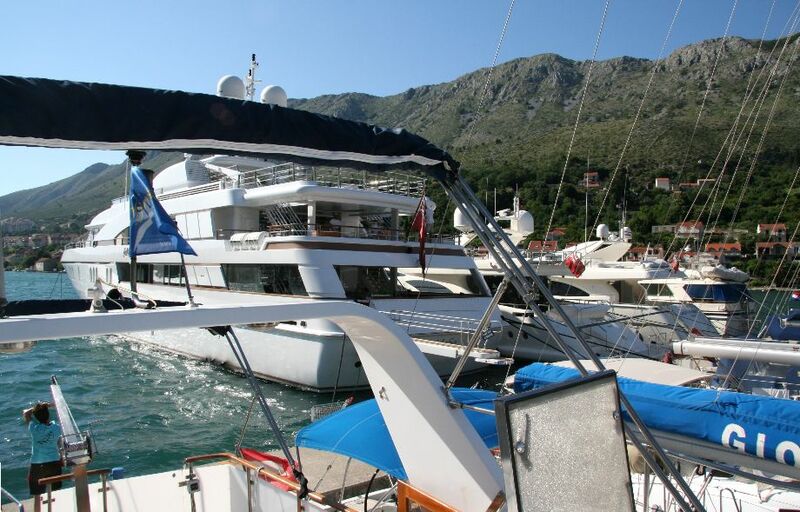 After arrival in Tribunj marina (with fresh NW) I get in touch with Offshore Boote; helpers arrive by 7:30 pm and block off the hot water supply to the deck shower. Ah! The domestic water system is restored and so is the crew's morale. 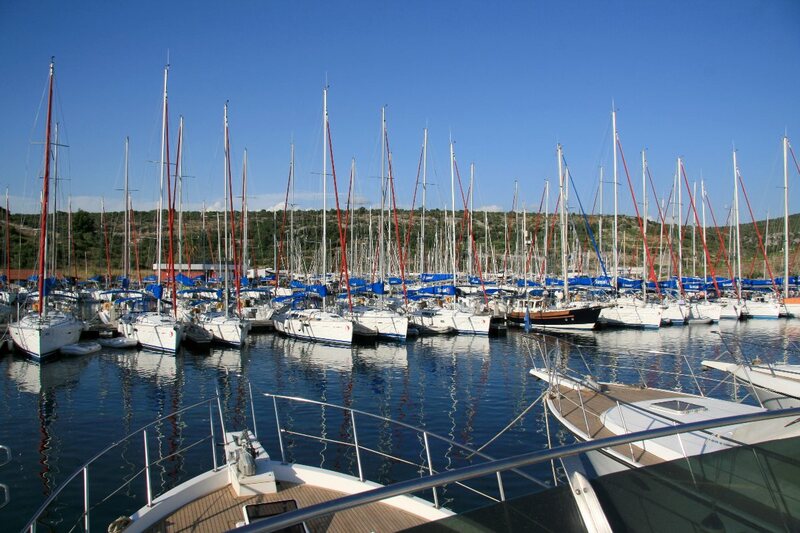 Marina Tribunj is mainly occupied by annual berth holders, a collection of expensive craft; we were just able to get a space. The upmarket marina looks modern and its facilities appear to be first class; prices are, correspondingly, high. For dinner we walk along the harbour towards the Old Town and choose the original looking Simuni taverna; it is fine, but it's sad to see there are hardly any guests any more at this time in the season. Approx. 17 + 8 = 25 nm. The day starts warm and sunny; the weather forecast is for a fine day with little wind. 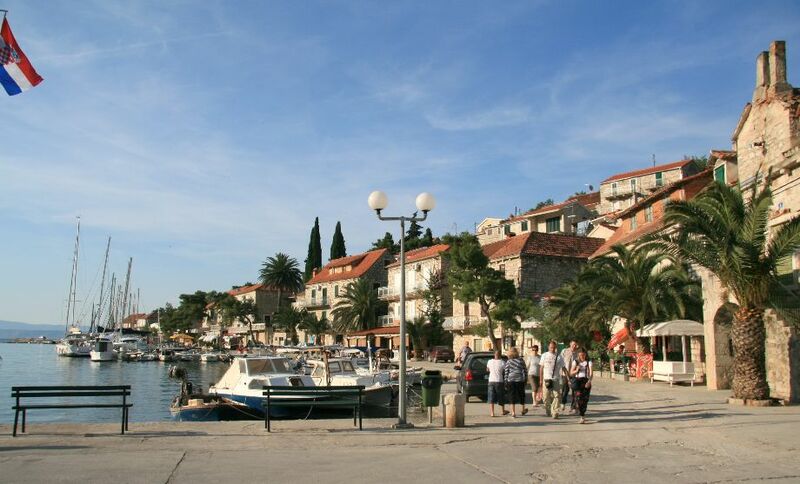 We visit the resort of Tribunj, and find the location of the Old Town on a small island, its stone bridge and town quay with cafes and bars very pleasant. 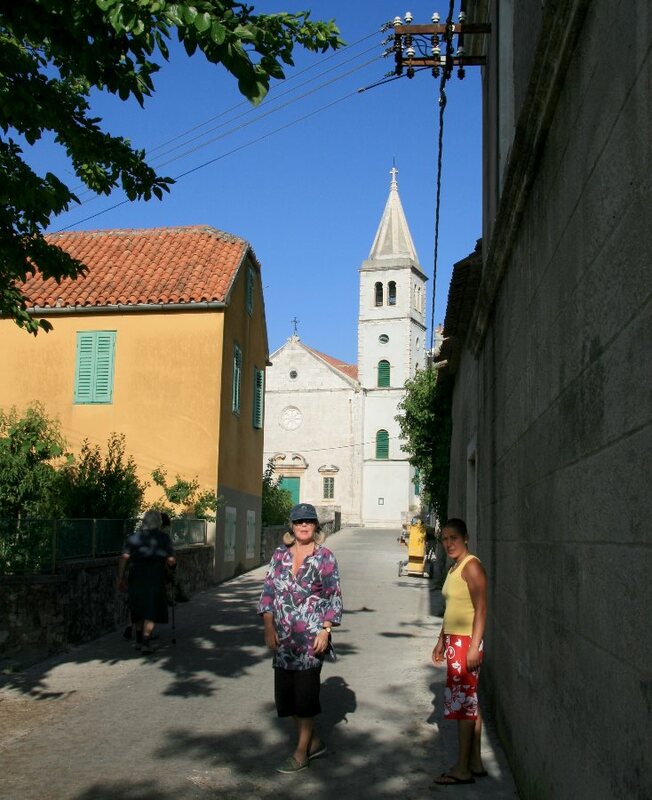 I take a walk to Sv Nikola church on the hill behind the Old Town. 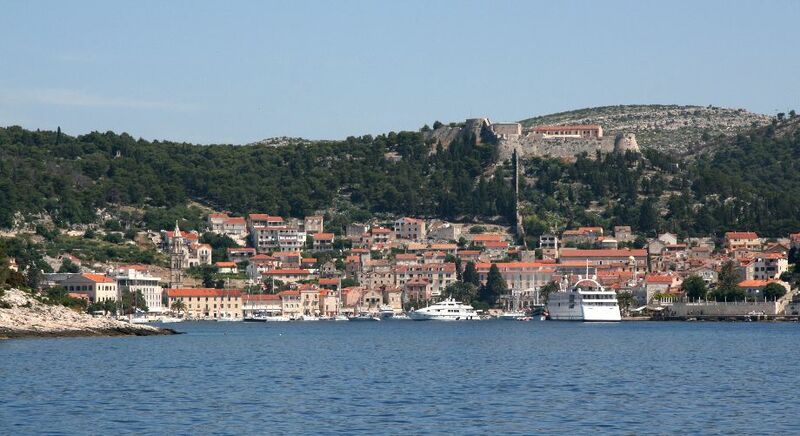 The splendid views over the Old Town and marina make the short hill climb, along a Way of the Cross, rewarding. 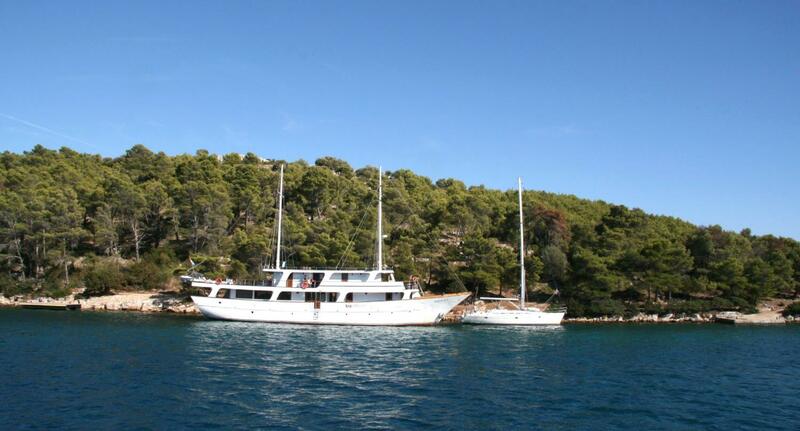 We leave berth at midday and cruise leisurely to Tijascica cove in the S end of Tijat island. The uninhabited cove is pretty and large, protected from the NW and obviously popular with yotties. However, there are swarms of intrusive wasps, so we decide to weigh anchor and look elsewhere; we try U Smetnja on the S central part of neighbouring island Zmajan, equally pretty, uninhabited and protected against the wind, but - alas - wasps again! 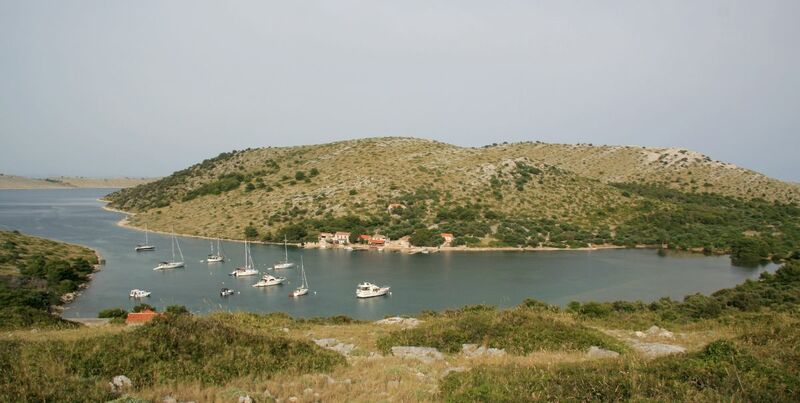 Escaping the insects we head to Vela Nozdra on Kaprije island, a mile across the SW. This time we are lucky and able to spend a fine afternoon lunching and swimming. 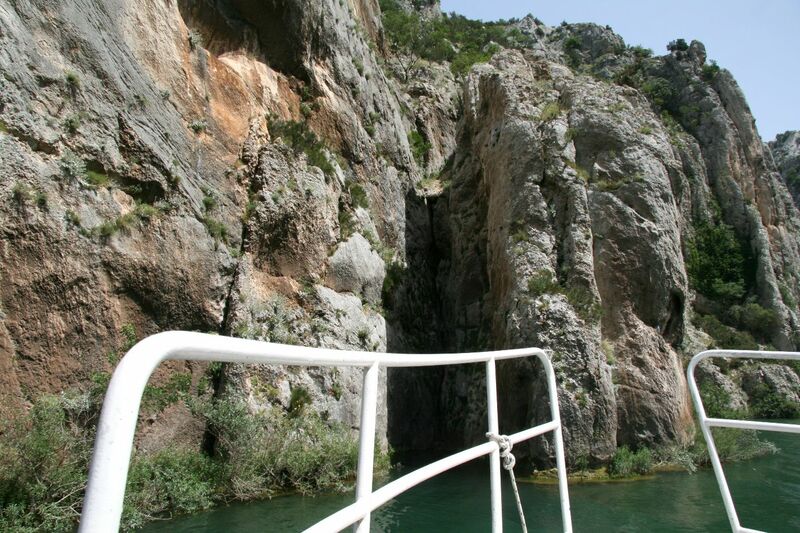 At 4 pm we head round the corner to Mala Nozdra (Little Nozdra) cove, where Matteo's restaurant has been recommended. We moor stern-to to his small quay. 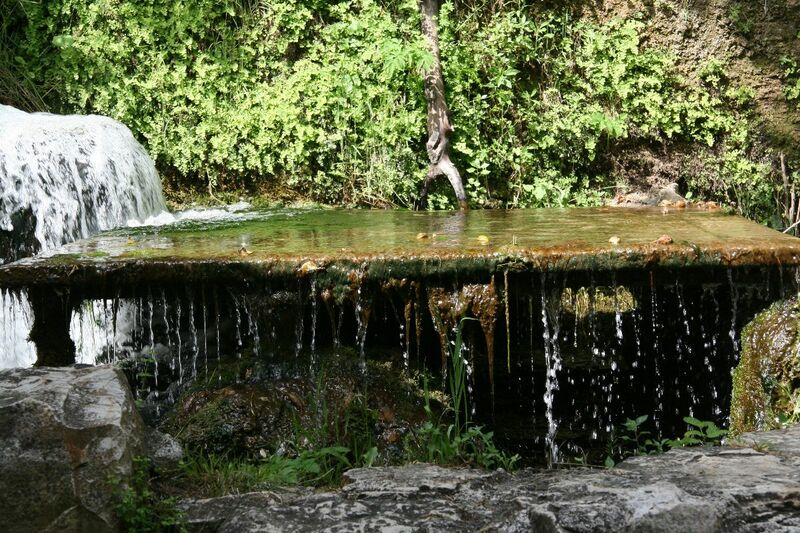 Mala Nozdra is a pretty and partially wooded cove, offering good swimming, and excellent cuisine and friendly service at Matteo’s rustic place. The cove is open to SE, but for the coming night there should be no issue. Just to mention, there are off course no electricity or water supplies for the boat on this island restaurant moorings. The high pressure weather has changed as a frontal trough approaches slowly from NW. During the night the wind has changed to a light SE. We leave Nozdra at 10am. The sky is greyish with hazy sun but very warm. Looked at U. Tratica on Kakan (SE of U. Potkucina), no protection from SE, some mooring buoys. 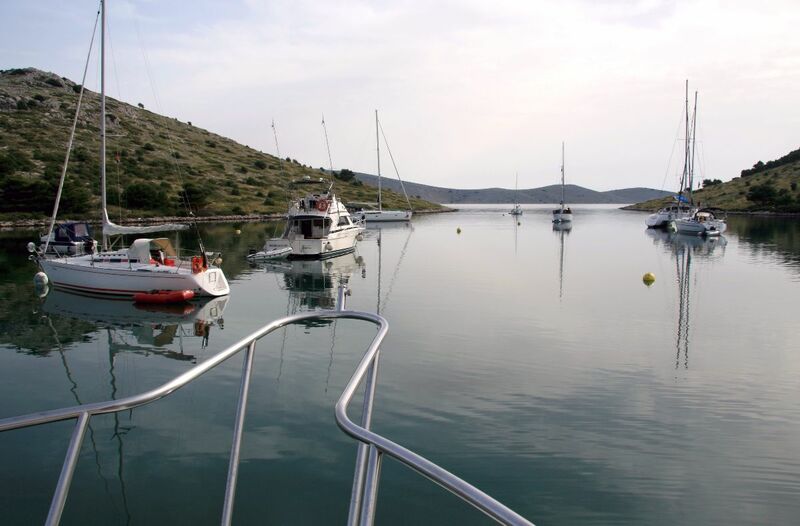 Potkucina is an ample uninhabited cove, one mooring buoy was spotted; good anchoring in 8-9m. 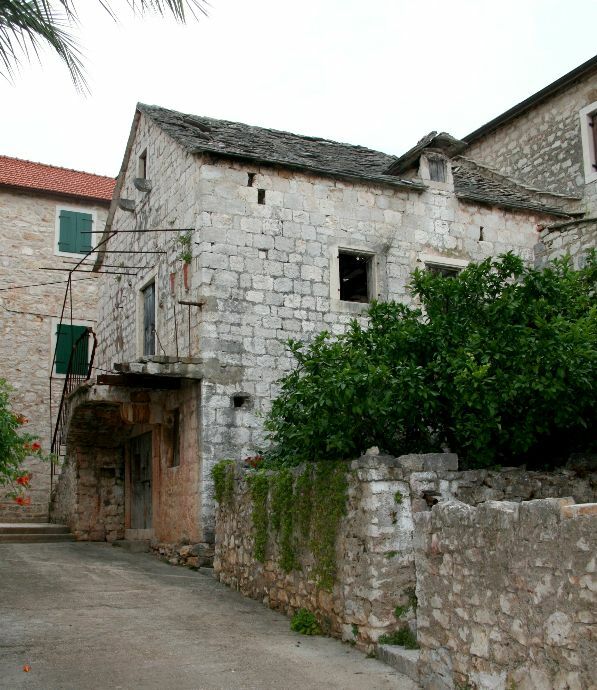 We then change to small U Vanjska on Kaprije, protected from SE, for swimmung and lunch. Around 2pm clouds gather and we leave the anchorage; go round the N tip of Kaprije and towards Zlarin for a harbour tour; light drizzle starts so we take to the inner helm. Zlarin harbour looks inviting and worth a visit at some stage; hardly any boats at this time. Grey skies on our way back to Kremik; the SE is blowing stronger and raising some swell. 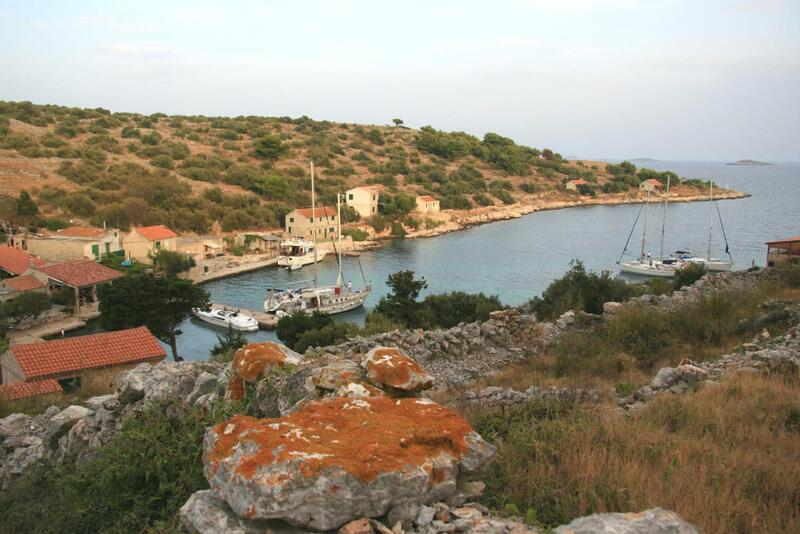 We make a harbour tour at Primosten, where there are still many yachts, but vacant spaces on the town quay and buoys. Berth in Marina Kremik at 4:30pm. The weather has cleared and the sun is out again, for the time being. We have dinner at the marina restaurant. Taxi picks us up at 12:30, our flight departs 14:10, and by 16: 00 we are back in London. Total mileage 115nm, most of it at 9kn displacement speed, some at 16kn. We have been very lucky with the weather, with temperatures more like high summer than Sept; had just one half grey day (which cleared up later). 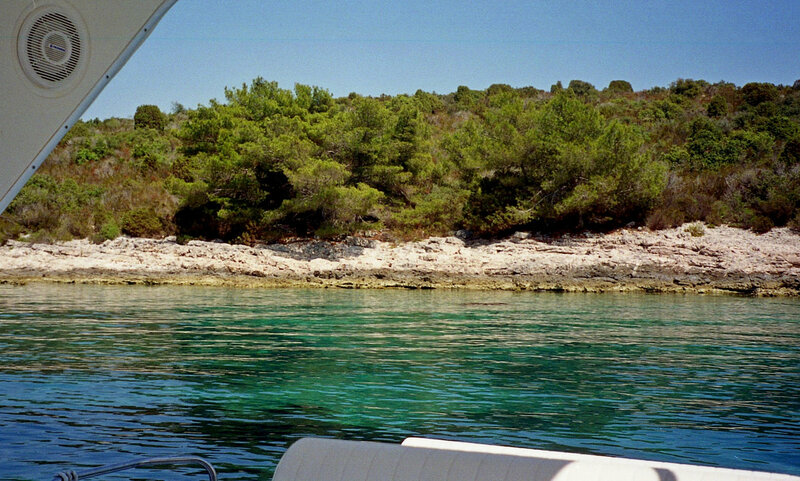 We have enjoyed wonderful nature, sun, swimming and good food; explored new islands and coves, including the enjoyable Sibenik archipelago’s. We also revisited places in the Cornati islands: Much to do and to see without having to travel far from the base at Primosten. 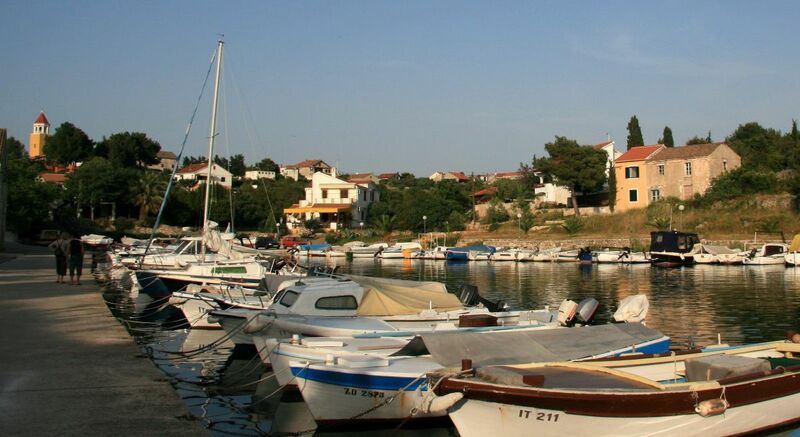 Jane quite liked Tribunj as a mainland resort, but thinks that Primosten has more to offer. Eating in island restaurants with jetties appears expensive (660-980Kn for 3, lower price is without fish), but considering the savings on marina mooring fees (maybe 480-580Kn) it still seems good value. Boat: “Star Two” Star Yacht 1310 (trawler style 13m / 43ft semi-displacement motor cruiser with aft cabin), 2 x Volvo AD41 Diesels. Flight London Heathrow to Split with Croatian Airlines. 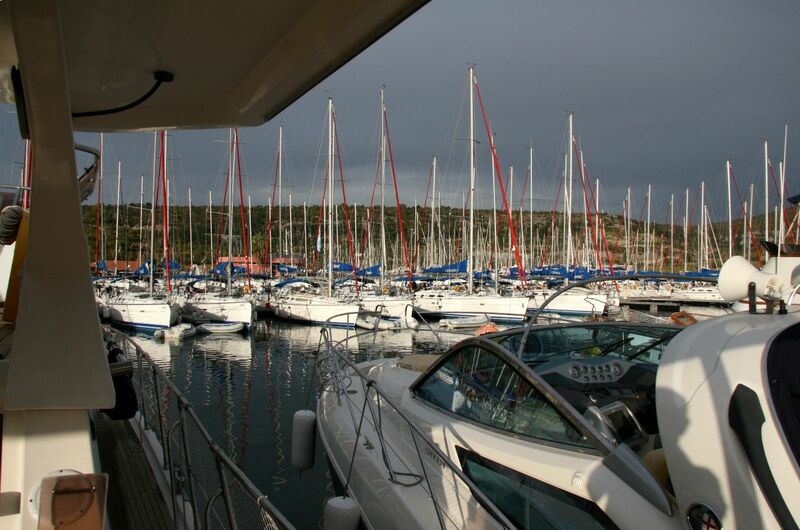 Arrival in Kremik Marina late afternoon and check in with Offshore-Boote. We test the systems of the boat and find some bugs which the helpful engineers need to rectify before we can go out. The boat has not yet been taken out in this season. The weather is clear but quite windy (Jugo); it is suggested we depart a day later, on Monday, when the Jugo would have blown out and we could expect a pleasant journey. So we spend the day settling in, having all apparent bugs on the boat sorted (defect windlass and remote; front bilge pump; wrongly wired anchor/navigation lights.) Sadly the auto pilot is defunct and cannot be restored for our trip. In the afternoon the Jugo recedes but clouds appear and some drizzle sets in which clears towards the evening. We take the shuttle bus to nearby Primosten and have dinner at Konoba Mediterran. The weather has cleared, only light Southerly winds. 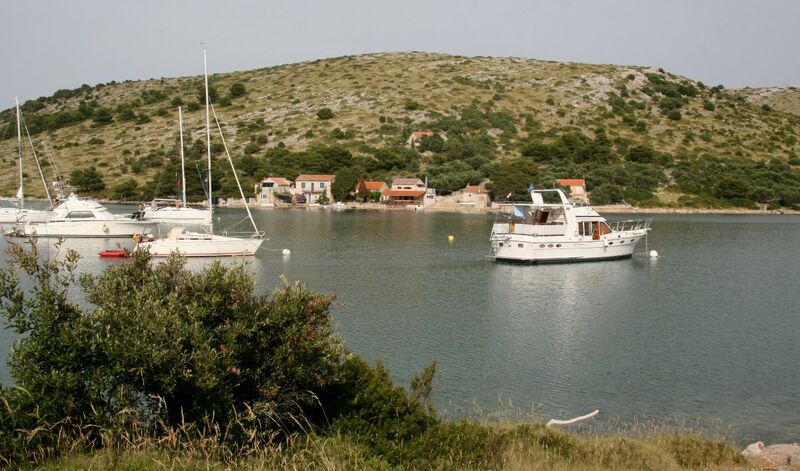 We start out at around 11:00 and anchor for lunch in Solinska cove on the South of Veli Drvenik island. 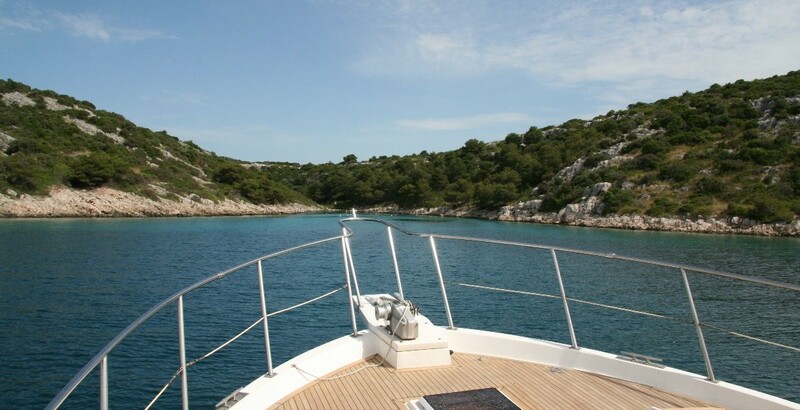 We are the only yacht at the time, and find the cove pleasant enough and good for a first swim. 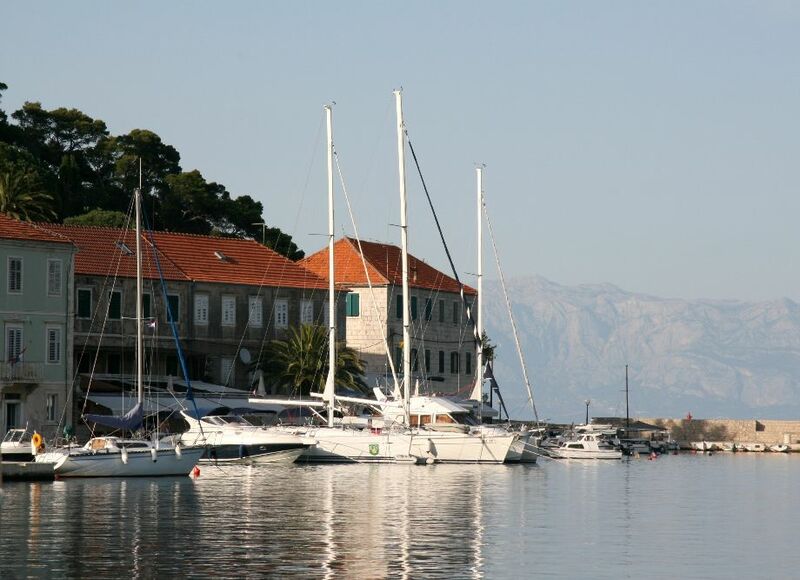 In the afternoon proceed along the South side of Solta and down to Hvar, Palmizana Marina on the Sveti Klement islands, one of our favourite marinas. Enough spaces available; the weather is fine and I have a dip into the water in the Palmizana, one of the few island marinas, where one can swim off the boat. We have dinner at famous Meneghello’s. We appreciate the “artists’” atmosphere, but feel that the food (at least our choice) is on the rustic side rather than sophisticated as we had experienced it in previous years; still a very enjoyable evening. Depart at 10:30. Lunch stop on Scedro, Smokova bay in SE, pleasant (but I do not swim as the water seems cold). 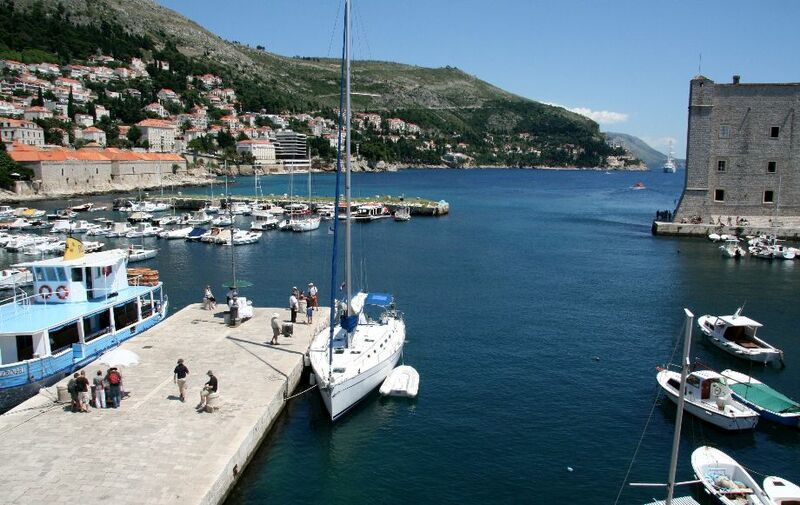 In the afternoon proceed to Korcula town; we find the ACI marina full (flotillas? ), so go to nearby Luka bay and anchor in the central S part at ca. 10m. The water is not clear enough, so I cannot check the bottom and anchor visually, but trust it will be ok for this (calm) night. Dinghy out and off to the ACI marina to go on land; dinner at another of our favourites, Adio Mare (has extended and renewed in the last 2 years but maintains its good standard of food). On return to the boat Jane insists on studying the night sky and explaining it to P.K. ; bright lights from the quay and restaurant do not help our night vision. I can never help being a bit restless at anchor, and get up a couple of times during the night to check wind conditions, just in case; it has veered all the way from NE to SW but is very light so all is calm and safe. 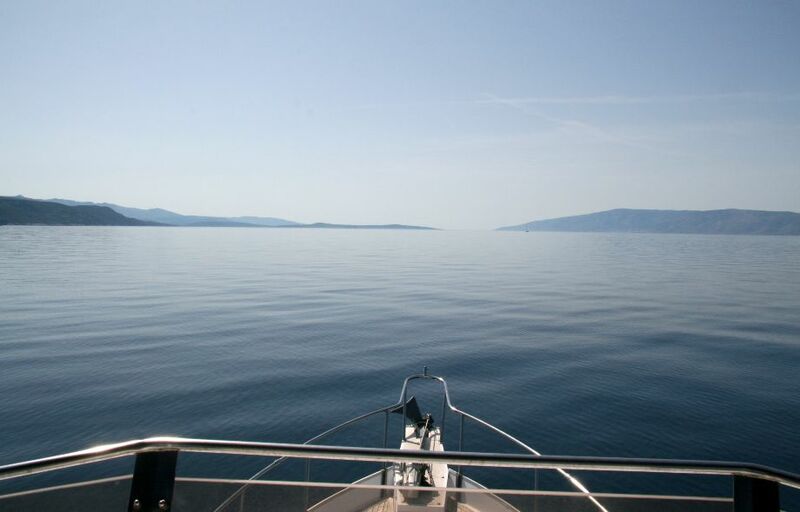 A fine day starts, after having breakfast we leave the anchorage at 9:30, and pass between Korcula and the islands of Badija (with its old monastery) and Planjak to the South, heading ultimately for Polace bay on Mljet. 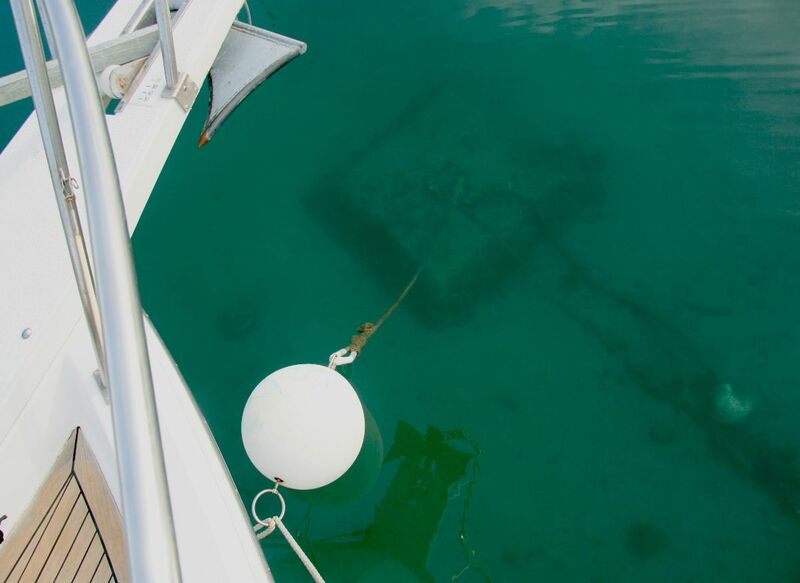 Anchor in N part of cove on 12m. Polace is a nice spacious cove. Several restaurants/houses can be seen on S side. Have lunch (as always on board) and swim. Restaurants are not only found within the bay, there is even one in the E of Polace in the approach channel between the main island and the longish Kobrava island (Borat). 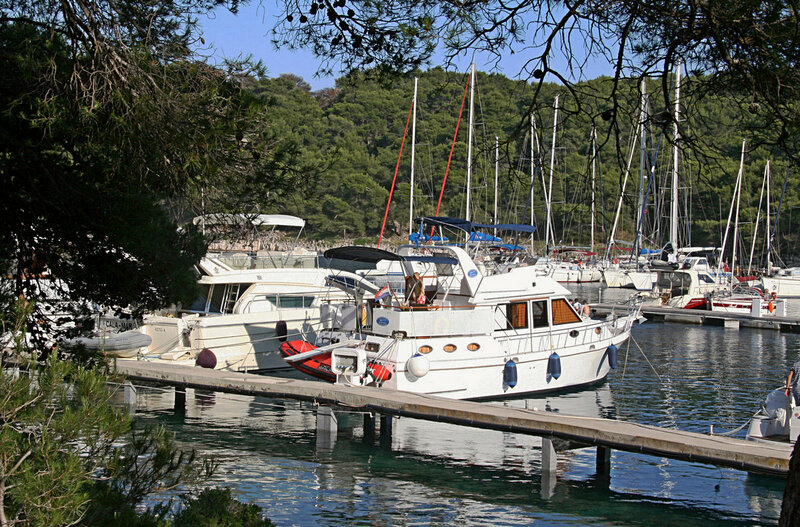 In the afternoon we proceed along the N coast of Mljet towards Okuklje. Prozura bay looks interesting, with its bizarre rocks at the entrance. 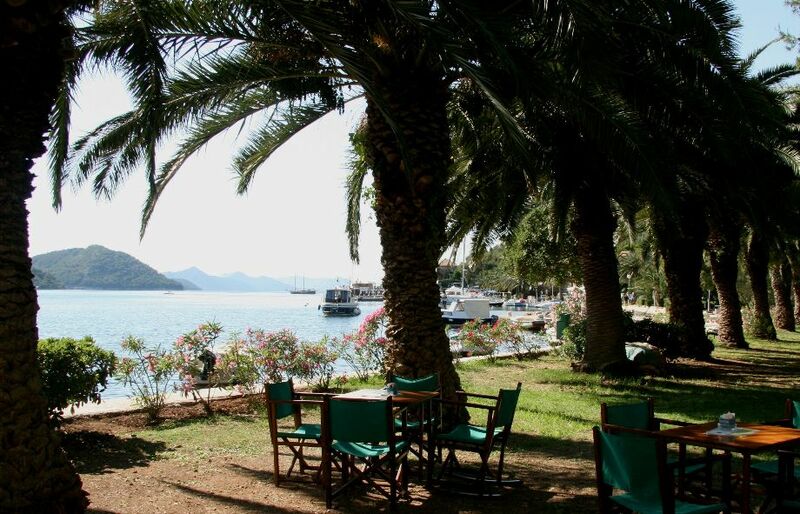 In pleasant Okuklje bay there are about four restaurants and some small room letting/B&B places. In early season however there does not appear to be any business for most of them; only Maran restaurants, which has been recommended, seems to be popular and attracting yachts. The person in charge of the small public quay next to Maran’s tries to solicit yachts to his moorings without luck, until, in the evening, he strikes gold when a luxury motor yacht of 25m or so squeezes into the cove, which has no chance to go anywhere else, and takes all the available space. Typically, none of the guests or crew seems to leave the boat anytime. We had been directed to take a mooring position on the ‘corner’ of Maran’s pontoon, which is bit awkward to get on land but so be it; we have good dinner and service (a strange 100kn items appears on the bill, which gets wiped out instantly upon enquiry, always check your bill). The popularity of the place also means it attracts noisy sailing crews, as we can hear next berth, but it is not developing into a problem. This reminds me of an incident at a restaurant on Mljet several years ago, where noise from a neighbouring boat got intrusive. 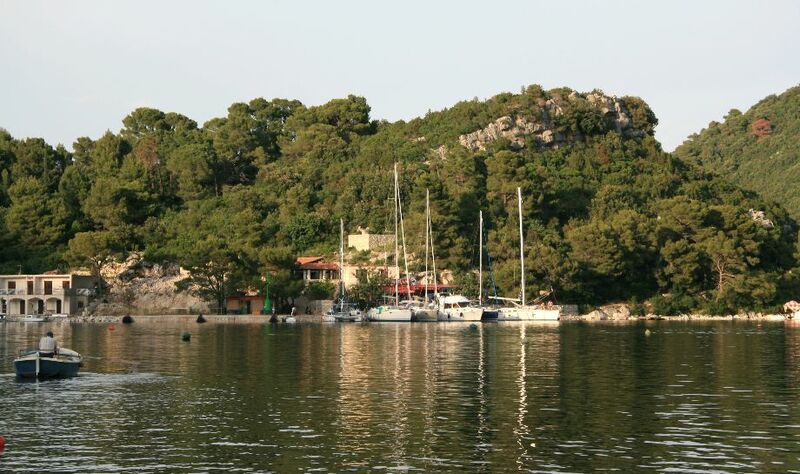 This has nothing to do with the restaurants themselves which close at the usual time; are the bays of Mljet a favourite of the kind of sailing hooligans and drunks “enjoying” themselves with shouting and chanting they could not get away with in marinas or harbours? A fine sunny day, again. 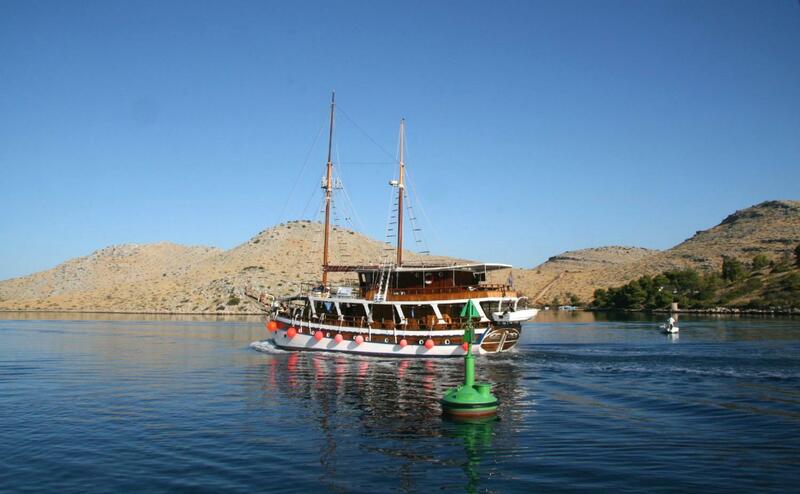 From Okuklje we cruise across to Sipan island and visit Sipanska Luka. Westerly wind has got up and blows into the bay as NW, so we decide to try to anchor in Sunj bay on neighbouring Lopud island, which is open to the South. We go down the East side of Lopud and, when turning W after rounding its end, to approach Sunj, the W wind gusts surprisingly strongly from ahead and shakes the bimini hard. 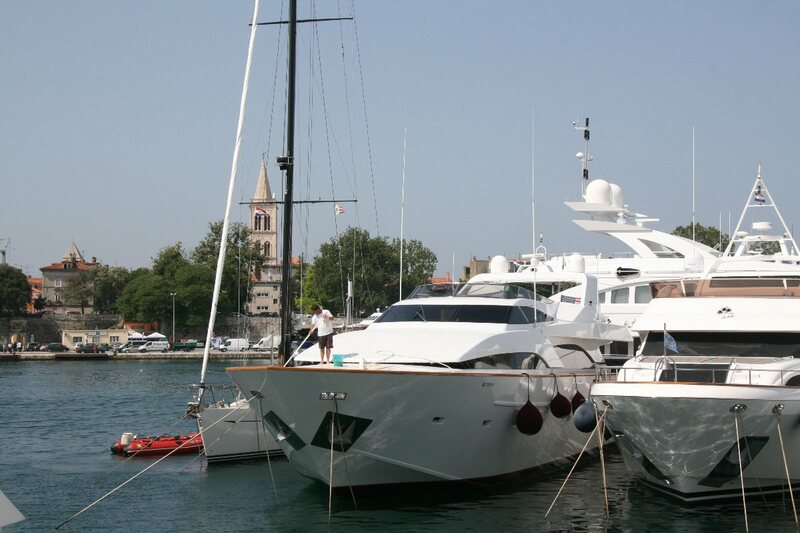 We anchor at Sunj, where there are already many yachts. Luckily the gusts of wind get lesser over the day. After lunch and a swim we go to the ACI marina at Dubrovnik (Miho Pracat) and are asked to tie up to the inner part of the first pontoon on its West end, just opposite some “Super yachts” on the outside of the pontoon, facing West. Most of those boats are in use by owners and are keeping in a normal quiet way, but the largest of all, a on the huge 50m ship called JeMaSa (C.I. registered, no guests or owners to be seen anywhere anytime) the uninterested crew is lounging about and has the generators running noisily all day and night. 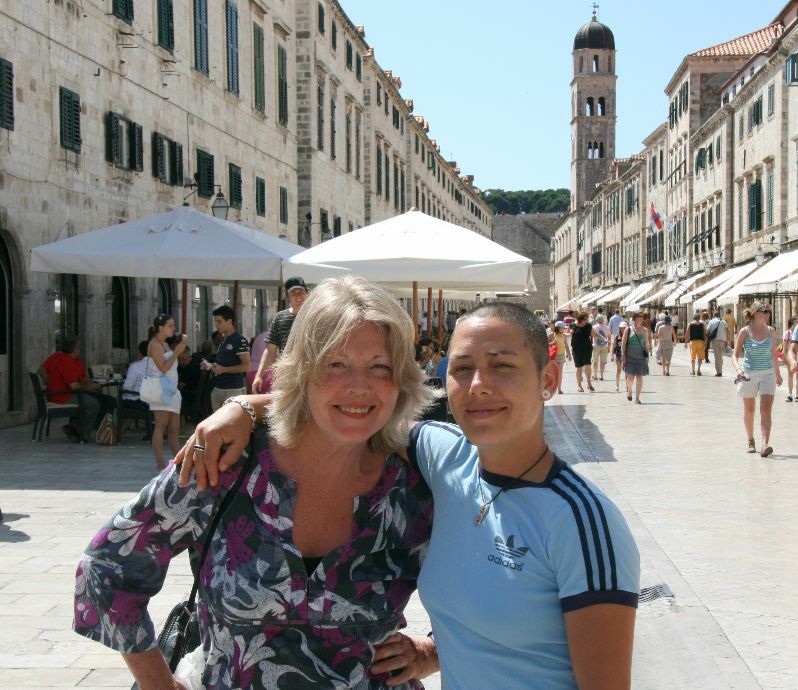 We go to Dubrovnik by taxi, as the bus service is very infrequent (45 min wait). Have dinner at Ragusa II restaurant in Prijeko street (parallel to Stradun). Delicate food despite the tourist setting; however, we need to complain about the poor tasting wine which is quickly replaced, without quibbles, with a much superior bottle. For the way back to the marina we take the bus which happens to turn up just when needed. During the night the wind from W continues blowing up the river valley and into the marina. At about 4:00 in the morning however the wind turns to NE, gusting against the bow of our boat. We have only got one mooring line so the boat is not ideally moored; one stern rope conflicts with the line from the davits holding the dinghy, causing noise in our cabin so I need to get up and rig an additional rope. An unpleasant and unexpected experience; the forecast had not warned of nightly gales! SIPANSKA LUKA on Sipan island, beautiful old villa, apparantly one of many in need of repair (this photo is now historic). In the morning the wind dies down. 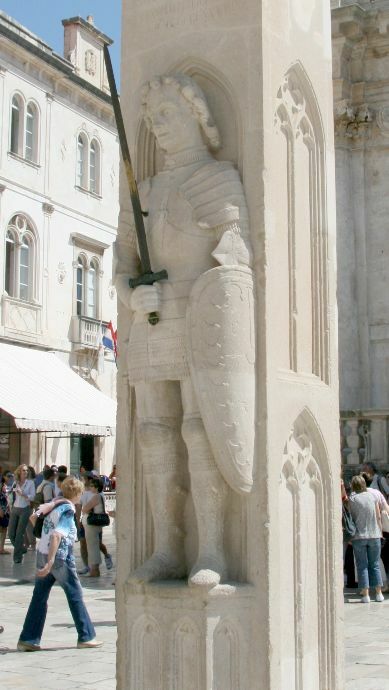 A hot sunny day starts, today’s agenda is sightseeing at Dubrovnik. We walk the walls, have lunch at a pizzeria in the old port in between the South and North walls, finally buy souvenirs and have coffee in Gundulic square. After returning to the marina Jane and P.K. 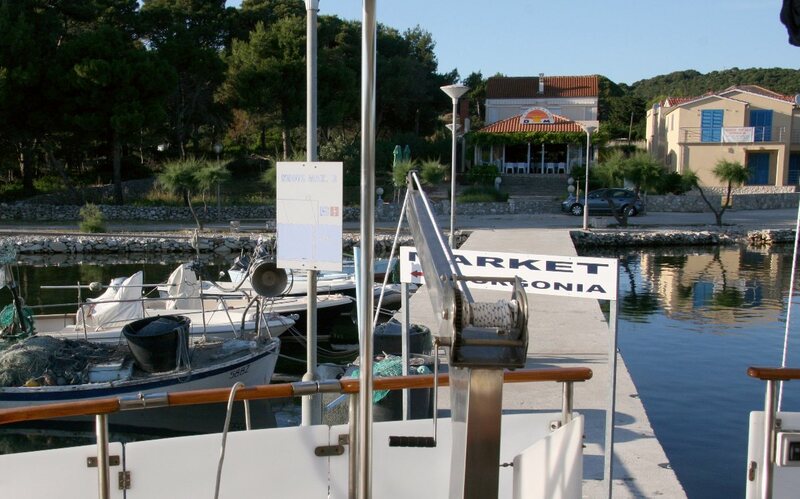 decide to try the marina’s swimming pool; this evening we are not walking any further but have a simple and value for money dinner at the restaurant near the marina entrance. A bright and hot day. 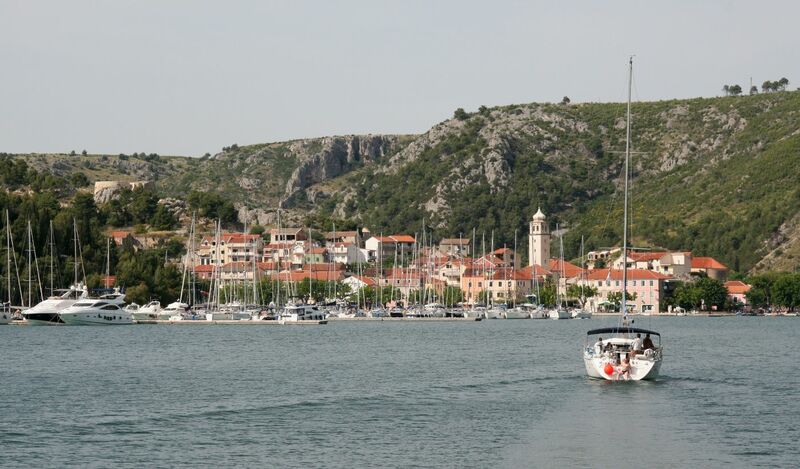 After refuelling at the marina fuel station we head for Sipanska Luka, where we had had unfavourable wind a couple of days before; this time the weather is calm. We moor at the harbour quay (moorings, but no electricity, apparently no toilets). Sipan harbour seems a bit of a forgotten place, low key tourism, hardly any modernisation. Today is P.K.’s birthday, so I suggest to try fish dinner at Konoba Kod Marka, which turns out to be quite special (no menu - the host chooses for you, trust him!). They have, by the way, three mooring buoys for customers, but, anyway, the moorings at the town quay are inexpensive and yachts can also anchor in the harbour. Do not try to go along to the pier; not only will gulets chase you away, but a big steamer (the Dubrovnik ferry) stays on the inside over night. Judging by its looks this vessel has been in service for at least 50 years. 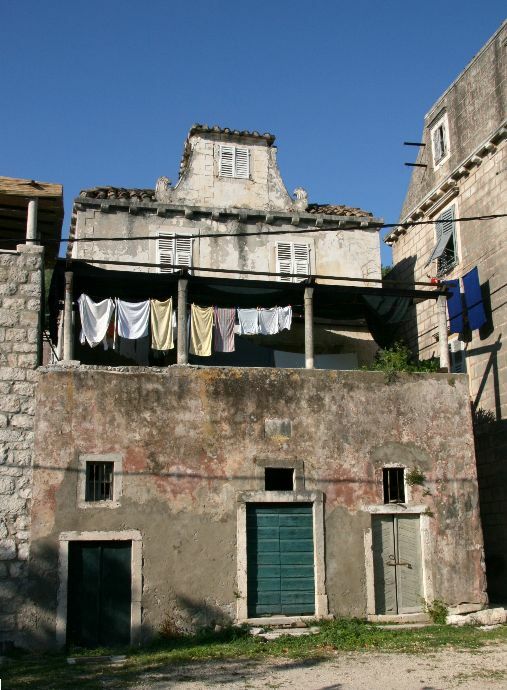 Sipanska Luka - a Seeping Beauty ? Some boat handling training for P.K. and Jane, before we get moving on our way back North. 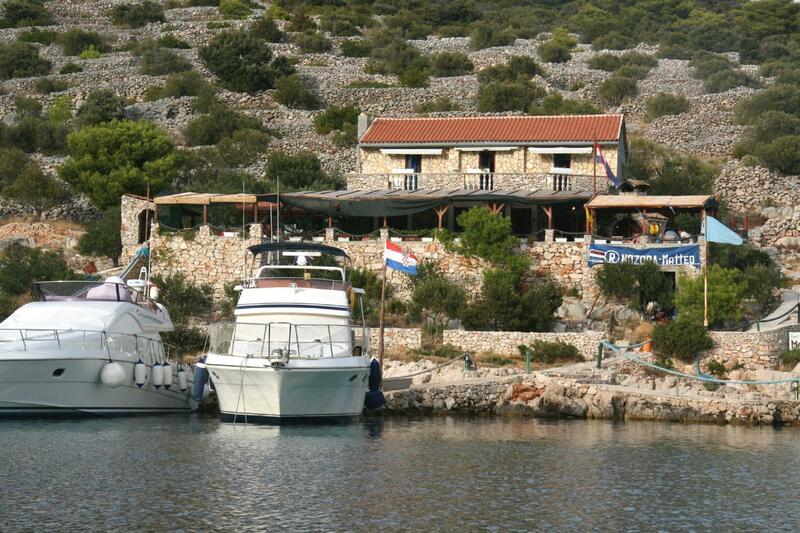 We anchor in Trstenik, at 6m in front of the sandy beach; this looks a pleasant small resort. Have lunch and swim; in the cove the wind causes some surprising gusts from SW; later outside at sea it is actually more calm. From Trstenik we carry on along the Peljesak to Orebic; the NW wind increases over the last five miles towards Orebic and the Korcula channel. Under awkward side wind we demonstrate our acclaimed mooring skills (boat has no thrusters!) and tie to the harbour quay for the night. The harbour is shallow, only 3m depth. 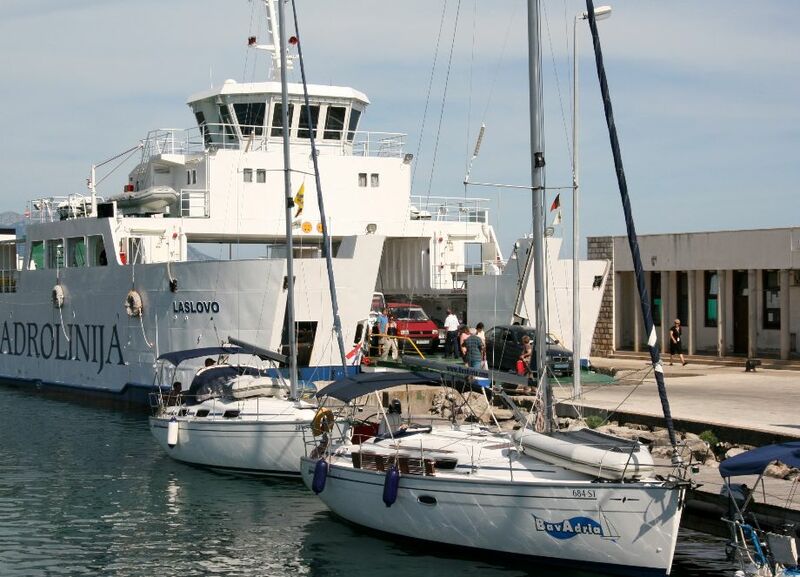 There are just four or five visiting boats, a friendly harbour master, electricity + water, no toilet facilities. 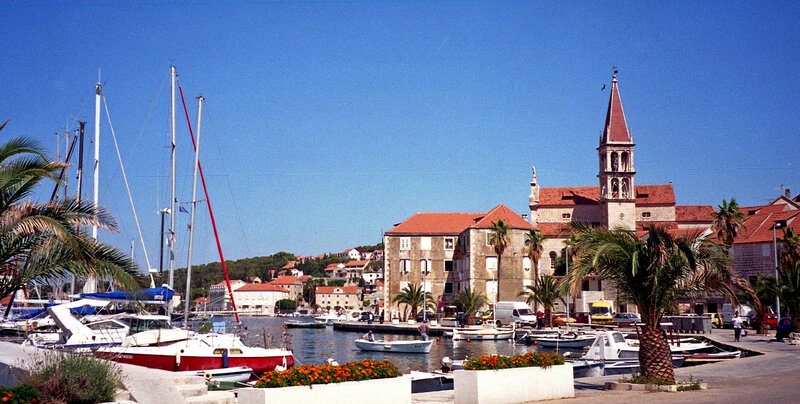 Orebic is a small local resort and ferry harbour to Korcula. 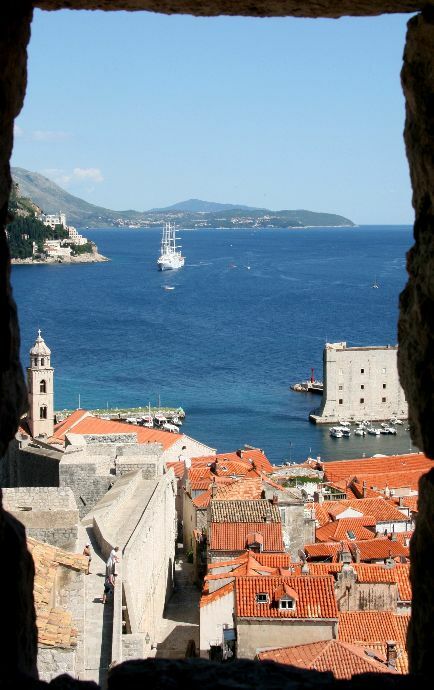 The views from the berth across the sea and over the Korcula are nice. We have dinner at restaurant Amfora: Very disappointing food quality, overcooked chewy tourist stuff served proudly on big plates, appalling house wine. Anyhow, this is our only bad experience with food so far; we disinfect ourselves with coffees and Travarica in the local café overlooking the harbour. We sleep well, despite the ferry. The large car ferry actually does not cause much noise, she does not even use ropes when mooring. Forecast is for a hot sunny day with little wind. 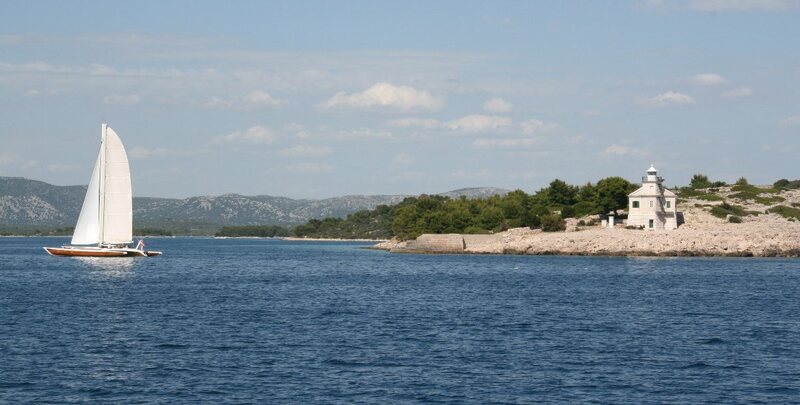 We leave port at 10:00 and go W through the Korcula channel close to the Peljesak coast. 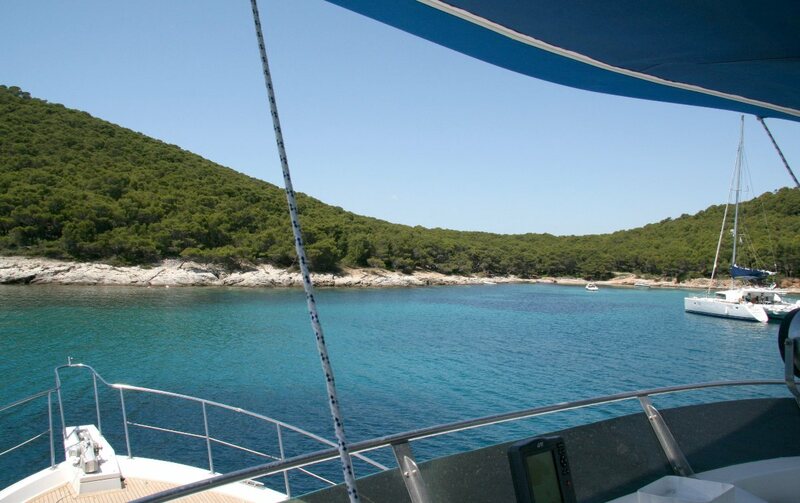 We leave the Peljesak behind and head N across the channel towards the South coast of Hvar, to explore some of the anchor bays there. We see hardly any boats, despite the brilliant sunshine. Smarska seems suitable for anchoring but we find it polluted with waste. Turning E, Pelinkovic and Smokvina are really too small for us to anchor comfortably; the same for Zaglav, where the shallow area is only at is very end tip. These tiny bays are suited to small sailing craft, larger craft will find them very narrow and may have to use landlines which is not convenient for short stay. Turning to E we try Mrtinovic cove but cannot get the anchor to hold for some reason. This worries me, and – having had a similar experience in a bay on Sipan – I wonder why our anchor appears to hold us only sometimes. It’s a Danforth, so it works - once it has hit the bottom - by its large flukes dropping down from the shank and hopefully burying themselves into the seabed when pulled along. I have already checked that the shank can move freely. But there is a short rope tied to a ring on the crown, which is used to secure the anchor to the windlass cleat during cruising. Maybe there is a slight risk, that this rope gets caught and jams between the shank and the flukes effectively blocking the flukes from dropping and digging in?? Just a weird guess perhaps, but I ask to take that rope off before anchoring, and – guess what - the hook grips first time each time from now on. (Or, if no other effect, it has at least helped P.K. perfect her skills of tying a bowline…). Reaching a further bay, Rasovatica, we are finally happy and manage to anchor. This cove is small too, but maybe the most pleasant of those we have tried before. More sun bathing and swimming. We are directed by the harbourmaster lady to go alongside a pontoon with electricity and water available. 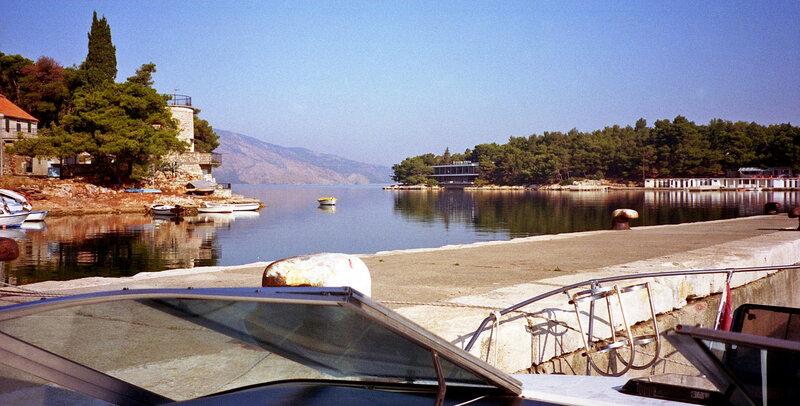 Sucuraj is a small fishermen’s village and ferry port too; we marvel at the Jadrolinja car ferry which turns up in regular intervals and hovers over the yachts moored close by. It does not cause much disturbance though. The weather is hot and almost wind still. There are about three restaurants; we choose the simple looking restaurant (Gostionica Fortuna) opposite side of the breakwater and ferry pier; our expectations are exceeded, seafood and fish are fresh, tasty and value for money. During the early hours SE wind has got up, which sends some swell into Sucuraj harbour and rocks our boat gently. White horses are seen outside, but no large waves. We go shopping and have coffee; by 10:00 the wind has practically died down. 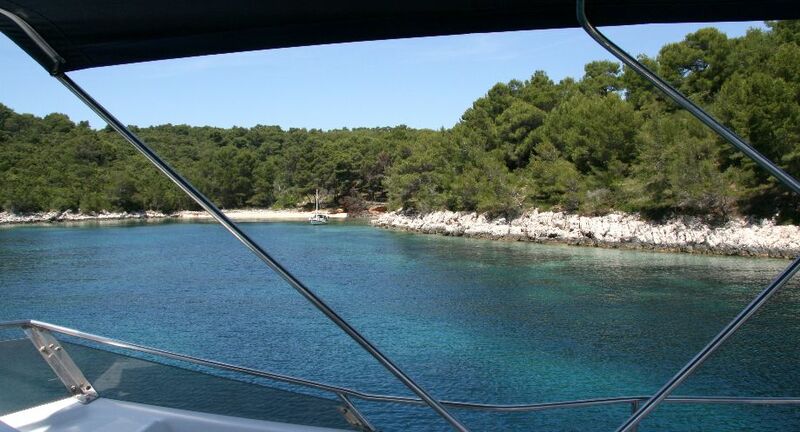 We leave port and head to the E, round Sucuraj point, the end tip of Hvar, and then along the coast to W.
There do not seem to be many bays on the first few miles in this part of Hvar; we carry on to Pokrivenik and anchor in the South bottom of the cove for lunch and swimming. 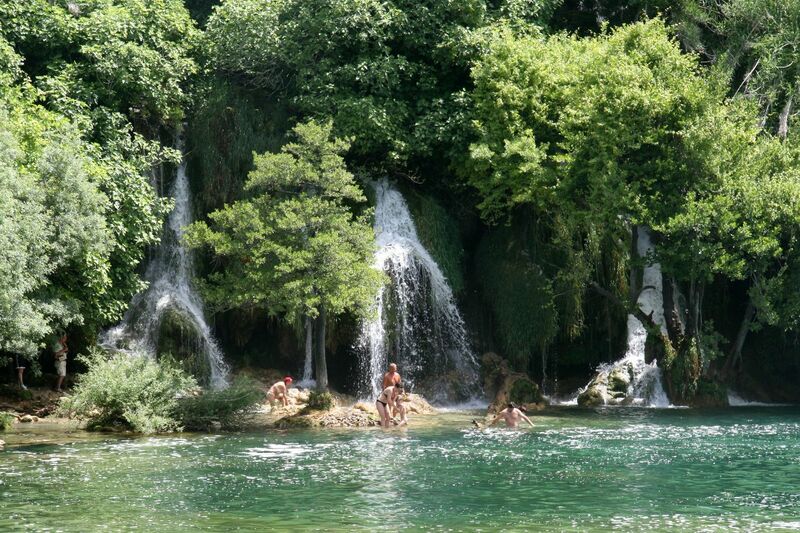 Pokrivenik is an attractive wooded cove surrounded by steep cliffs and rocks, and good for swimming. 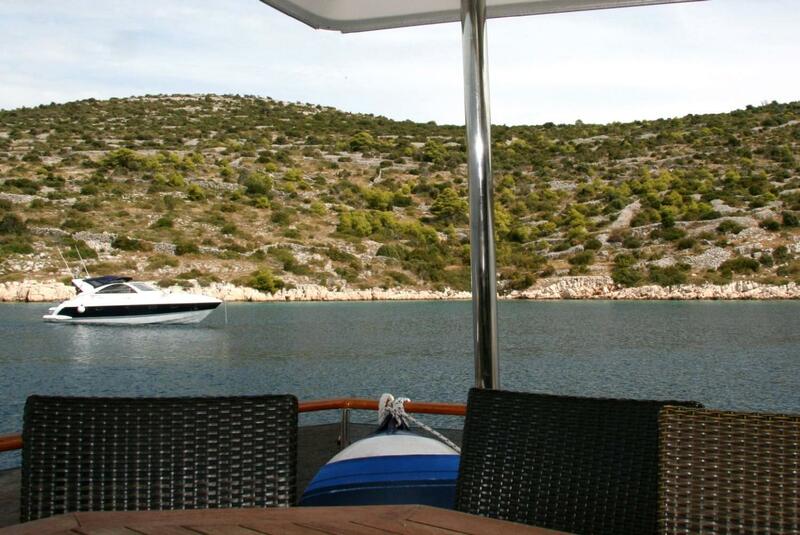 In the outer part of the cove there is a restaurant with some moorings, which is open and canvassing for guests. We are the only yacht in this part of the cove. The weather is bright, hot and completely calm. After 15:00 we leave and head for Jelsa. It feels strange to cruise on a completely calm sea, like glass, with no other yachts in sight anywhere. 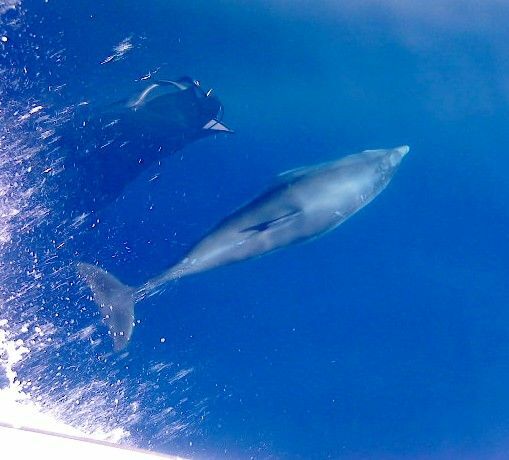 The only encounter we have is a dolphin, which playfully swims with us, diving before our bow and our sides. It seems disappointed that we are not a fishing boat offering him food, so turns away. A dolphin can swim much faster than our comfortable cruising speed of 8.5-9 kn which keeps noise down and saves fuel. Oblivious of the sight of man. "Our" dolphin; note the reflection of our boat's bow above. Berth in Jelsa on the quay on the North side. An unexpected small gust of W wind makes the berthing manoeuvre less smooth. Jesla is a pretty tourist village around its harbour; we fancy dining with views over the port and watching the sunset, so choose the ‘Buffet’ in the SE of the harbour with its terrace for dinner; quite reasonable food and glorious sunset. Afterwards have coffees and drinks in the charming village square. Forecast was for cloudy weather, NW winds; clearing during the day and wind getting less. In the early morning NE wind starts, which sends an unpleasant swell into Jelsa harbour, rocking and rolling our boat on its mooring. The fact that the neighbouring sailing yachts appear to be thrown around even more does not please me. 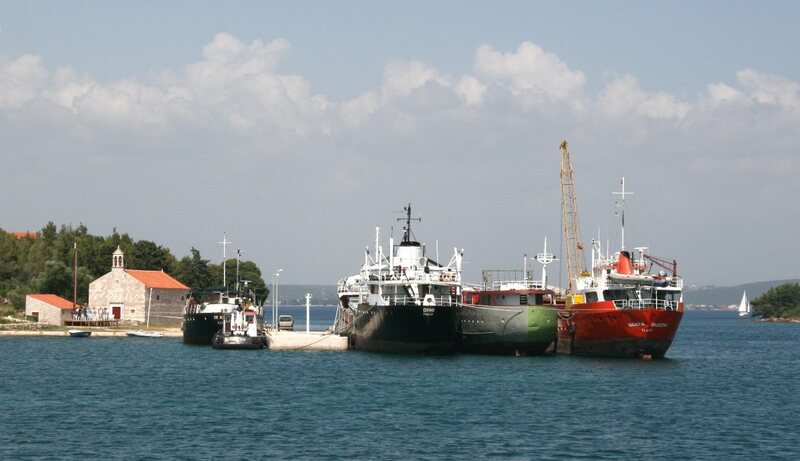 Jelsa harbour is poorly protected against swell from NE. The wind diminishes from 8:00 but the swell keeps going for a while. We have coffee in the town square and do some shopping. Going back to the boat the NE wind has got up again; Jane feels there was no point in leaving under these conditions; cloudy weather. I am keen to get a more detailed weather forecasts and work on my PC; Jane starts doing a wash of her and P.K. 's clothes despite the swell which makes the boat bounce and roll (!) - a movement I strongly dislike. By 12:20, having enough of the rocking and rolling, we leave port; if seas feel too tough outside we could just turn into neighbouring Vrboska, a safe harbour. Once outside we find favourable conditions and anchor in the bay just North of the entrance of Vrboska, protected from wind and swell. The skies clear and we have a calm afternoon and swim in the bay. With the weather getting close and hazy later we leave for Vrboska. Past the ACI marina, and to the town quay, where there is still plenty of space around 16:30. A very friendly and welcoming marinaio helps us moor up. We walk around the village, visit the quaint old fashioned fishing museum and marvel at the unusual mighty fortress church. Dinner at the restaurant above the ACI marina, very pleasant. Later clouds return and there is a little bit of drizzle. Vrboska is a nice relaxed place. They have improved the quays, and ‘little Venice’ looks cleaner. There are however several abandoned houses/ruins, even in prime positions, same as 2006. 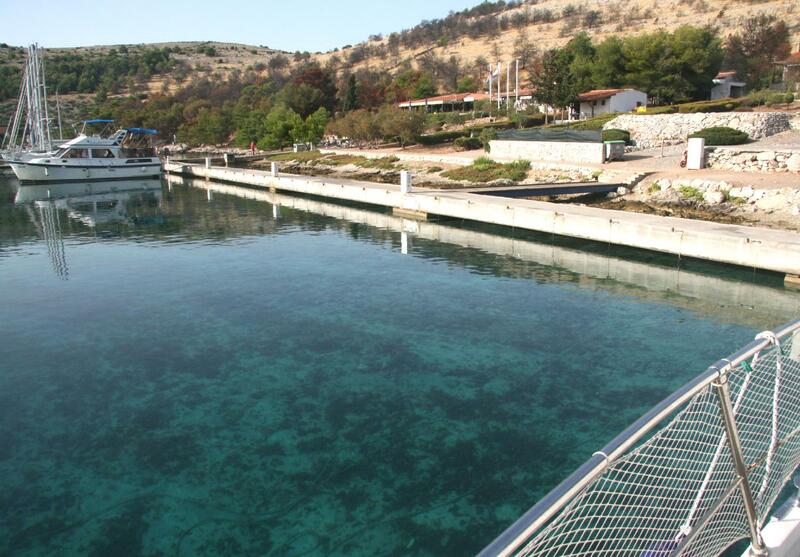 The ACI marina has this year been extended with a new pontoon using more space in the centre of the cove. Forecast is for NE winds. We leave Vrboska 10:00. Some rubbish floating in the sea (as observed frequently during this trip: Never before have we spotted as many plastic bags and debris in the Croatian coastal waters). 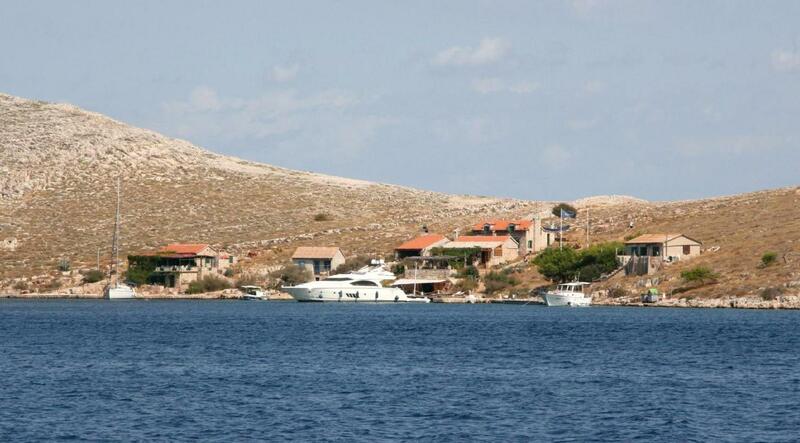 We follow the North coast of Hvar and anchor in the inner part of U Zokova ca. 11:30. By this time wind has got up, changed to SW-W and is felt in the cove. We have lunch and at 13:00 decide to leave for Solta/Brac hoping there might be less wind. 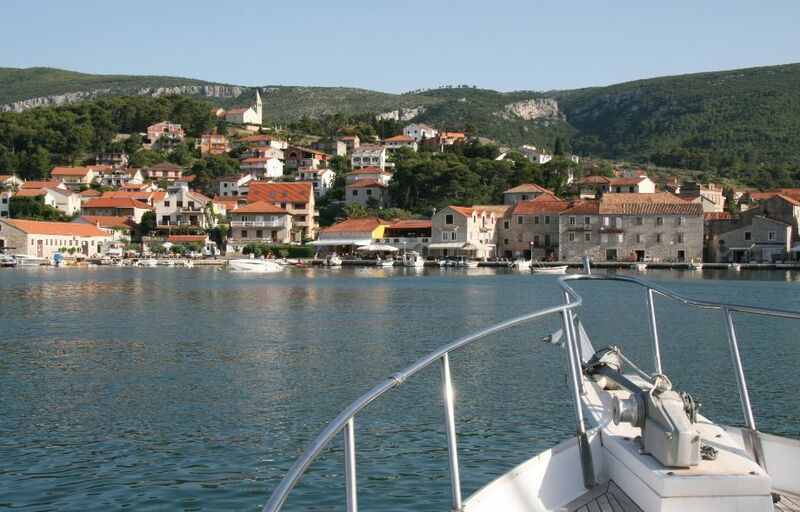 We cross the Hvarski Kanal westwards towards Solta and go along the coast of Brac. The Westerly (up to 5 Bf) raises moderate waves (1-1.5m) and makes for a bumpy ride. The marine forecast had been for wind 4-14kn (2-4 Bf) only, but, as often, the afternoon wind is stronger. 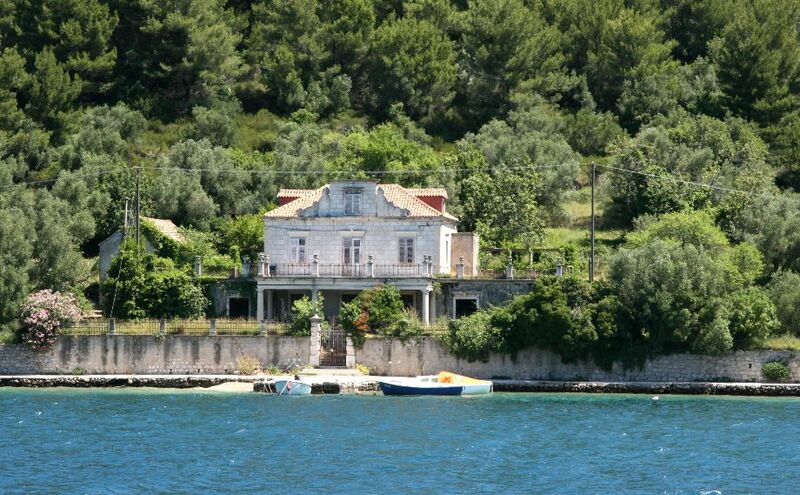 We go into bay Lucice on Brac, for ‘shelter’. 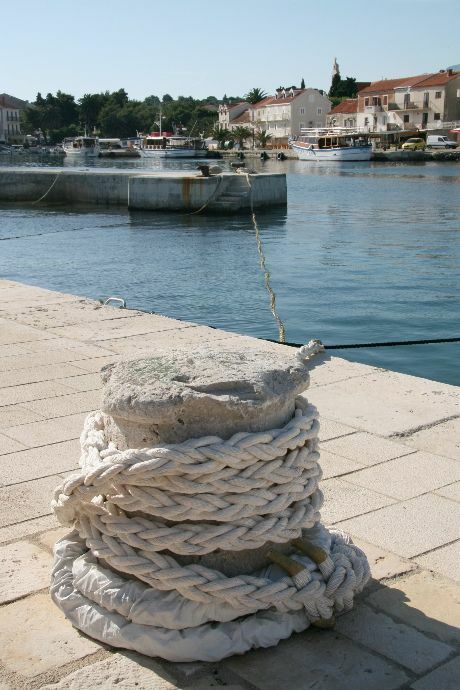 Anchoring would be difficult because of the depth but there are numerous mooring buoys belonging to the restaurant. 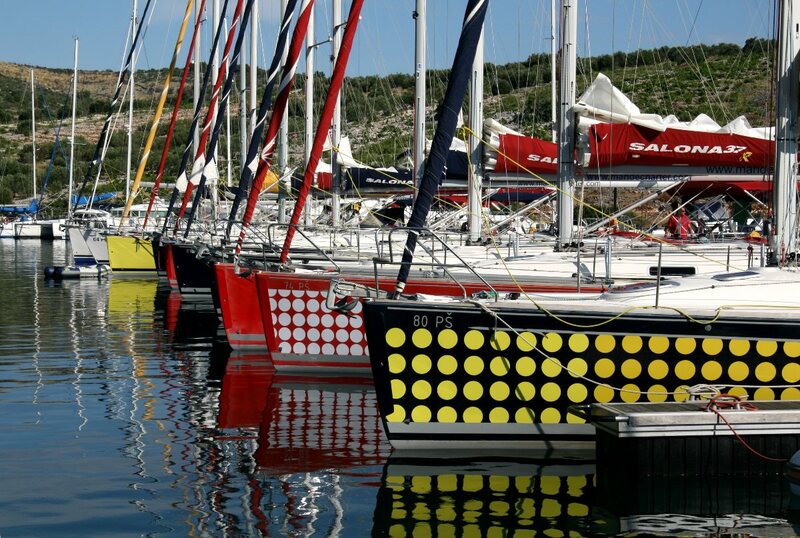 There are already many yachts on buoys; we take up a free one. A guy comes along in a dinghy and asks whether we were staying over night; we say no, only want to have a swim, couple of hours. No fees asked. It's a blowy but bright weather. We leave around 16:00 for Stomorska on Solta. The ride is still bumpy with waves of some 1.5+m; as usual the crew cheers to the fun ride and the skipper has to do the work, hmm.... but after a couple of miles we pass Rt Ratanj, get in lee of Solta and all is quiet again. 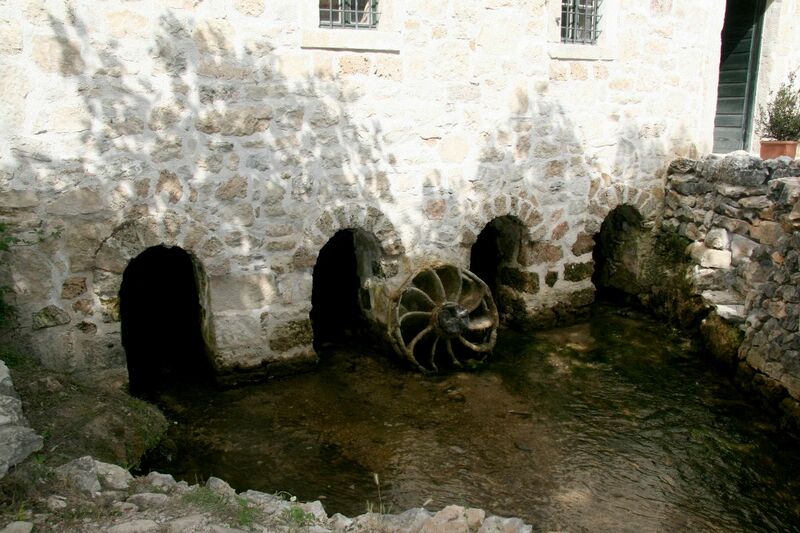 We complete the short journey at 17:00, and moor at the public peer (with electricity and water). Stomorska is a friendly small place. The close by church is not easy to spot (it is above the public quay), but prominently heard at 6:00am in the morning. Have dinner at restaurant Turanj, on the opposite side of the public quay, who serve a good fish dinner. The neighbouring O-la-la restaurant is a noisy “live music” place, that means a one man local band, who seems to try to entertain the whole cove until midnight. We have the impression that, maybe due to the early season or the economic crises, there is not much business around (yet). However, today we have spotted more yachts outside than the previous days when there were hardly any to be seen. 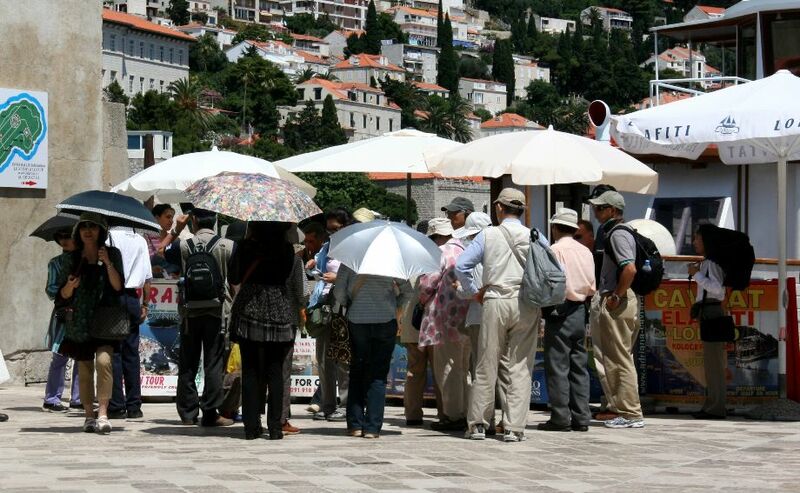 Tourists in this part of Croatia include Italians, Croatians from other areas (and other Slavic language people), Austrians, Germans, Antipodeans, even S-Africans we have spotted. Our last day at sea of this holiday, we need to return the boat in Kremik marina this afternoon. The weather forecast is for moderate to fresh SE winds increasing to 4-6Bf in the afternoon along the coast. In view of the experience of the past days I am concerned the wind might get even stronger, so decide to leave earlier and go to a protected bay on the way to Kremik where we can monitor the wind. 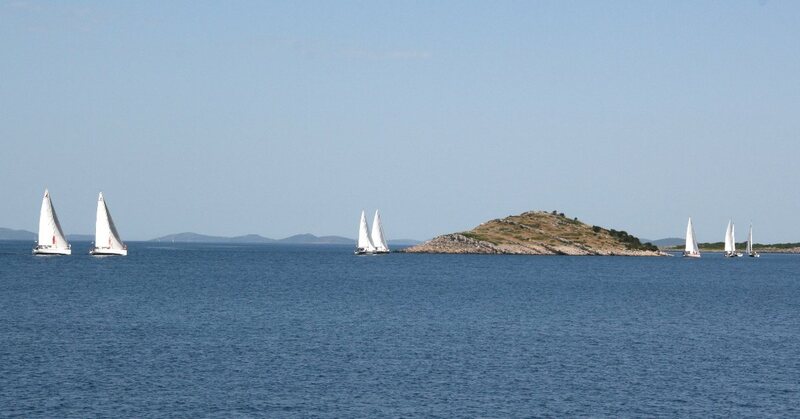 In fact, the morning is almost completely calm with flat sea and it turns to a perfect sun cruising day. 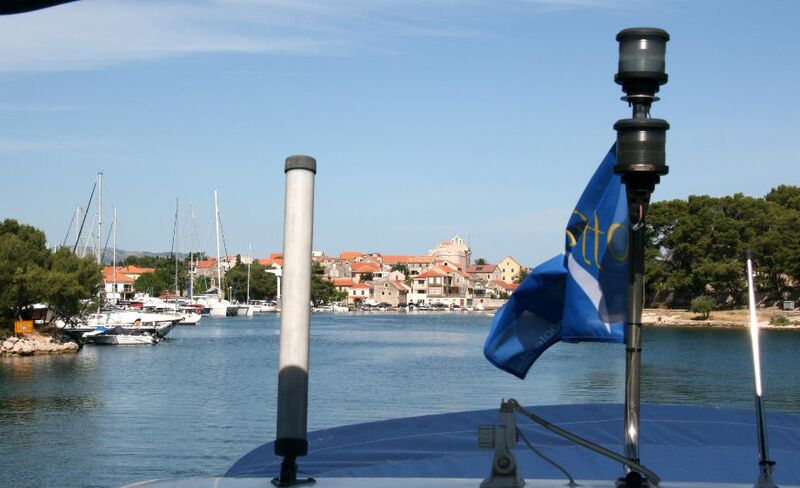 We cruise to Veli Drvenik, tour the small harbour (few boats, the moorings behind the breakwater appear fine), about three restaurants. 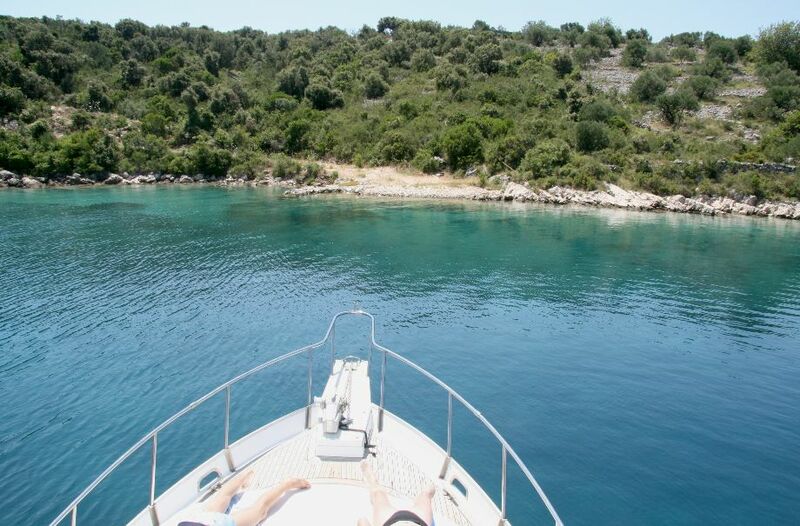 Then go to Mala Luka cove (South of Veli Drvenik harbour), and anchor in the East tip, at about 6m; good swimming cove, unspoilt, albeit getting a bit narrow for larger yachts at its shallower end. After we arrive there we hear loud cries of seagulls from the end of the cove, and later become witnesses of death in wildlife: A young gull, apparently injured, is floating in the water gradually giving up its ghost. Another gull flies around in circles crying, and only turns away after the one in the water has finally stopped moving. The weather remains calm and sunny, perfect for swimming; we have lunch and stay until after 15:00; then it’s time to depart for our charter marina. Very light Southerly wind, and hot. It’s Jane’ birthday next day, so we take the taxi to Primosten for the evening and dine on seafood and a large skarpina (the red scorpion-fish) at Stari Selo. We find Primosten a charming and lively place; at this time it’s not overcrowded. The weather has deteriorated; the forecast SE wind finally got up and is blowing across the marina. We hand the boat back by 10:00; taxi to Split airport at 12:00. A very enjoyable two weeks’ holiday has finished; we have been very lucky, with no accidents, injuries, bad encounters or technical problems, but lots of hot and sunny days and mostly perfect cruising conditions. The only losses are my old sun glasses which have found a final resting place on the seabed in Sipanska Luka. Boat: “Blue Star”, Star-Yacht 1520 (15.2m semi-displacement trawler style cuiser, 2x Volvo TAMD61A diesels), chartered from Offshore-Boote, based at marina Kremik, Primosten. 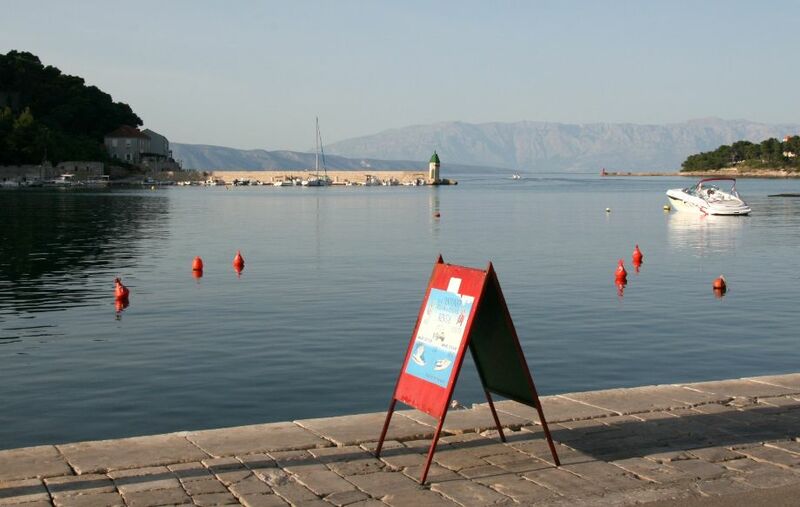 We arrive from London Stansted 21:00 at Kastela/Split airport, by taxi to Marina Kremik, arrival after 22:00, in time for a meal in the marina restaurant. It seems very quiet; we assume this is due to the fact that Kremik is a charter marina with all turnover activities on weekends, but today is a midweek day. We sleep on the boat the first night. We take our boat over formally. The procedure is relaxed as always, and the staff helpful; some technical quibbles on the boat get fixed quickly. A power cut in the Primosten area at 10:00 means all that computers are down; we have to wait until power is back before we can go food shopping. Luckily power is restored soon. We leave berth around 14:00 and head for Skradin. 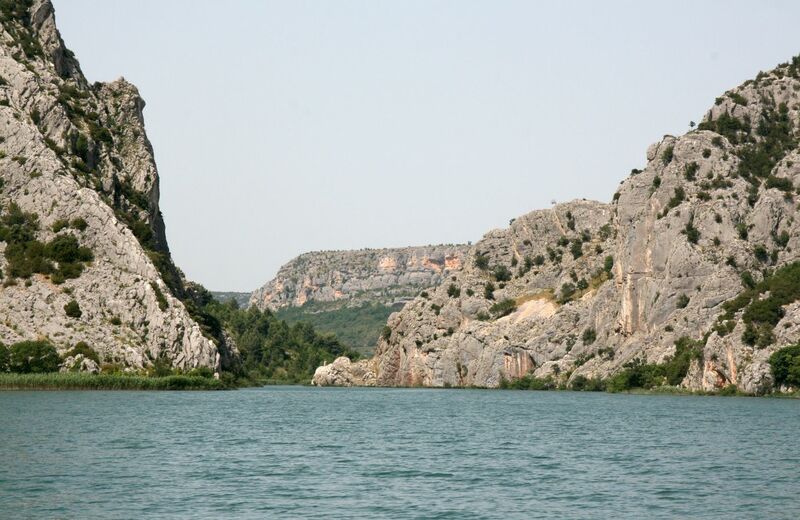 We pass Sibenik and following the Krka river upstream. We berth at Skardin marina (ACI) around 16:30. A particularly welcoming and helpful marinaio explains the village and the excursions to the Krka falls to us, for next morning. It’s excellent and hot summer weather, with just a breeze from SE, the scirocco/maestral. 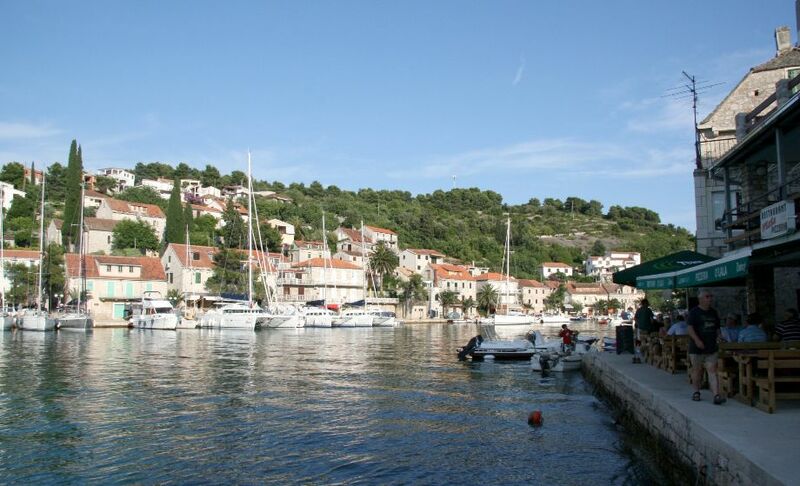 Skradin town is pleasant, we dine at restaurant Bonaca and enjoy quite a good dinner. 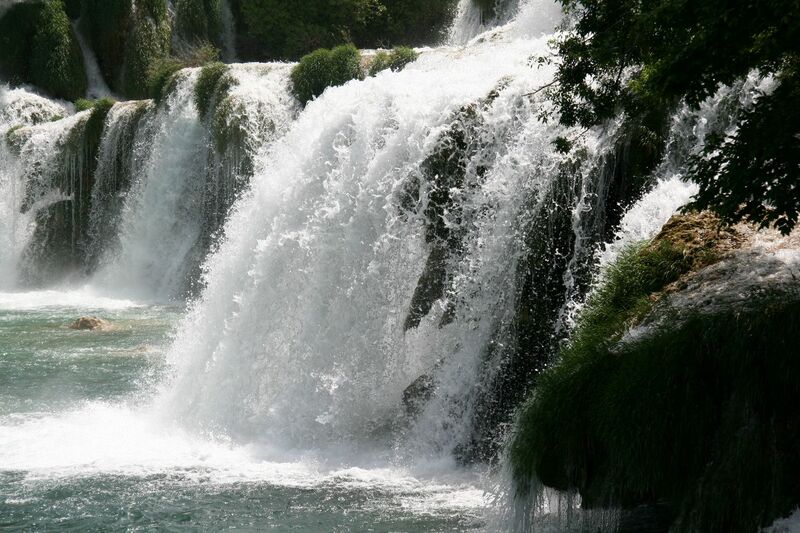 The hot summer weather (high pressure above the Adriatic) continues; we buy tickets for the Krka national park and take the boat from Skradin to the falls. We take the full circle walk around the falls, which impress with lots of water after heavy rain falls in earlier spring. and Roski Slap. We find it odd that no information or tickets for these trips are available at the main entrance to the National Park. We choose the nearest departure time, which is a taxi boat for 12 people. 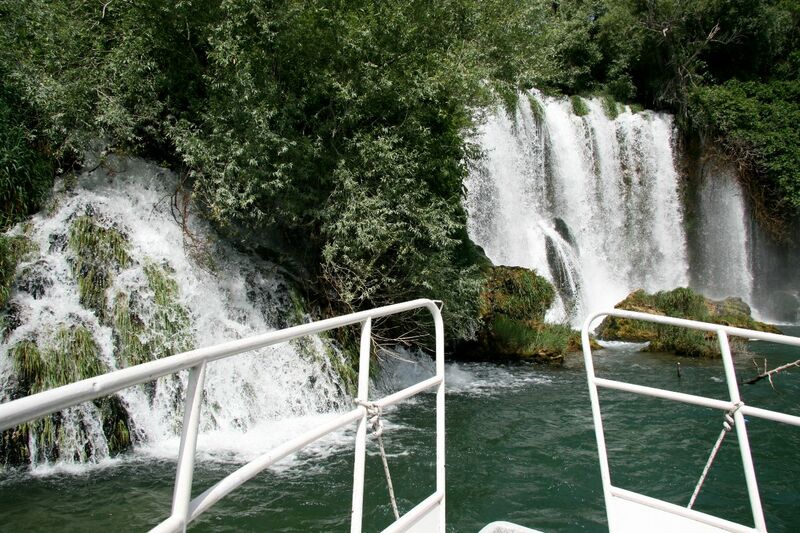 Our captain is quite a character and does his best to provide his guests an entertaining and memorable trip through “Croatia’s Grand Canyon”, shoehorning his boat into cliff crevices and spraying his passengers under waterfalls. berthed next to us in the marina; they seem nice people and really experienced sailors. We leave berth at 10:00 and head down the Krka, which has a speed limit of 5kn; finally through Sv Ante channel to sea and across to the Kornati. Through the main channel we reach Lavsa, where we take a buoy in the bay. Lavsa is a nice bay, and after the lengthy trip from Skradin we decide to stay here for the night. 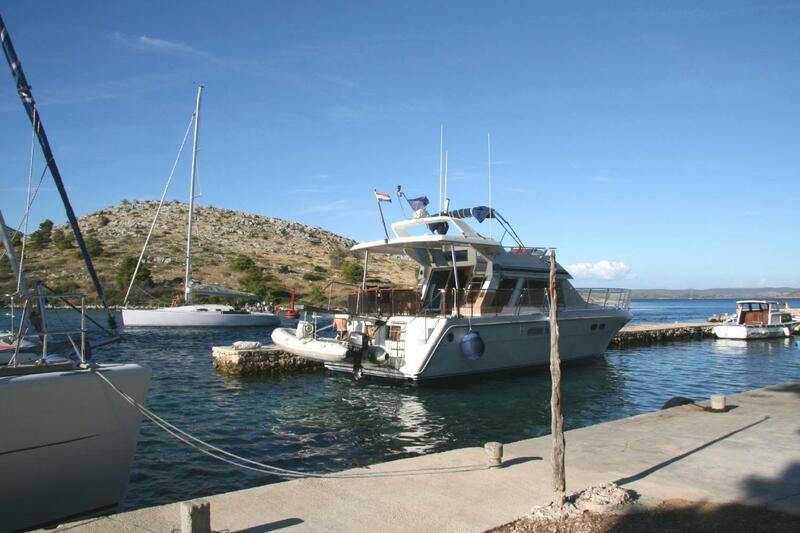 A boat from the Kornati national park authority arrives and charges us 400Kn. We are told that it would have been only 250Kn if we had bought an advance ticket in one of the national park offices. Jane and Willi take the short walk, or actually climb, to the hilltop above the empty house opposite side of the restaurants; there are good views over Lavsa and towards Piskera islands. This evening there aren’t many boats here; Idro, the only restaurant, looks so quiet that I wonder whether it operates at all; anyhow, we get into the dinghy and go over, and find the owner only too happy to serve us. It’s Saturday and this means turnover day for charter boats, hence fewer boats out here. Plus, sailing crews often save money and eat on board he says. We have fish dinner and find the service pleasant. View towards Piskera; the pontoons of the ACI marina can be spotted in the distance. It seem quite empty. There are several mooring buoys in the bay. 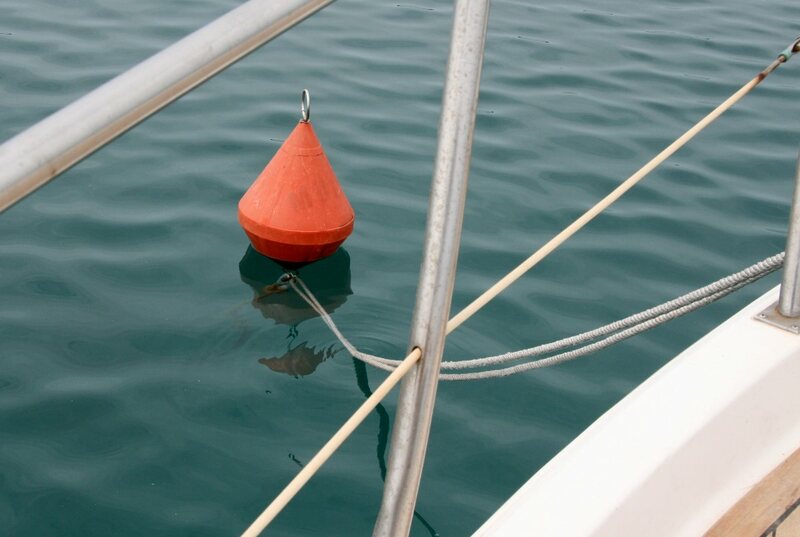 They certainly make mooring easier than with an anchor, and give a sense of safety. (Whether the rope on the concrete block is strong enough to hold a heavy boat in a gale force bora for long remains to be seen). Proversa Mala. We note some additional buoys near restaurant Aquarius. 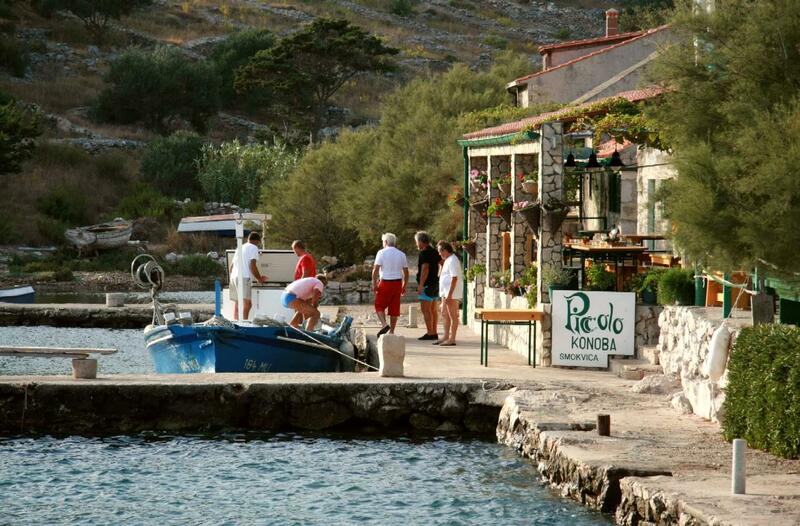 On the way further along the E coast of Dugi Otok we decide to anchor for lunch on the W side of Krknata island which is meant to be an ‘anchorage in front of ancient olive trees’. We spot the trees, but the water here is too chilly for me to go swimming; maybe because it flows through the channel, same as in the main Iski Kanal. The choice for eating out is only between one restaurant and a pizza outlet. After an exploratory walk through the village we choose the restaurant, Grill Mare, for dinner. The football championship is on, which means a lively evening for the quay side cafe which has got a TV on. We too, though not into football, sit down for after dinner coffees. Bright sunshine wakes us up early. 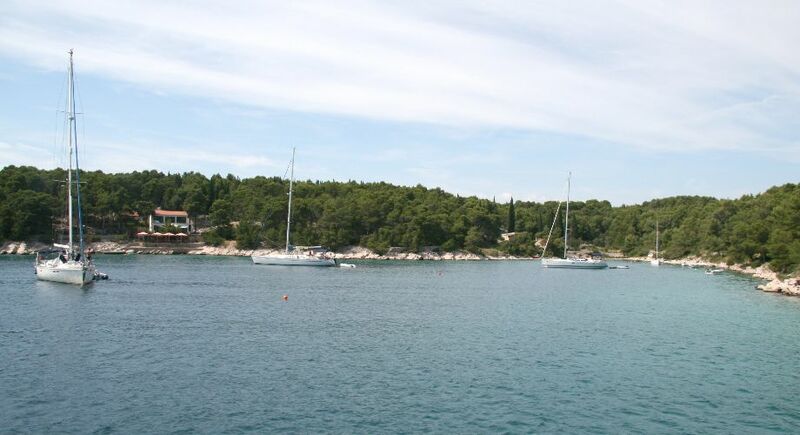 Molat is a friendly place but after the hours of motoring on the previous day we want to have a good day swimming and lazing at anchor; so we leave berth and head for nearby Pantera bay at the N end of Dugi Otok. 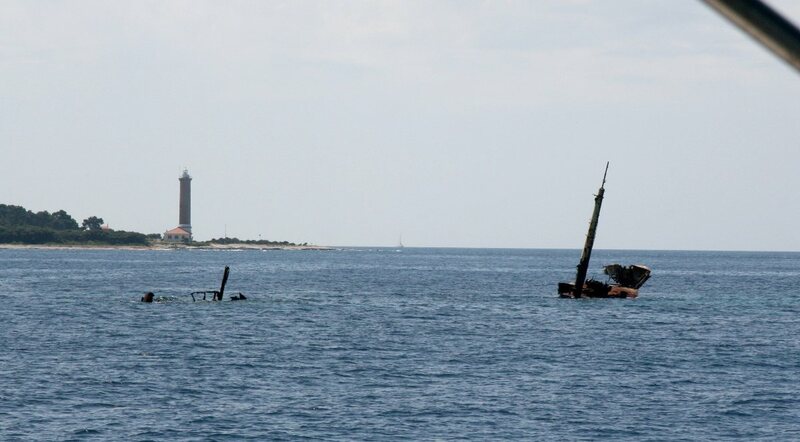 First, of course, we do a tour of the well known wreck in vista of Veli Rat lighthouse. The large Pantera bay offers numerous buoys which are easy to pick up; it provides excellent swimming possibilities and nice views. We decide to stay over night nearby; the first idea is to try the new Veli Rat marina, but once under way we venture past the marina and through the narrow passage into the more shallow Cuna cove. The head of the jetty of ‘DM’ restaurant is just what we need, offering enough depth to go stern-to the end, at a water depth of 2m. We are helped by the friendly restaurant staff. The mooring rope here is not the usual silty “slime line” but quite sharp on the hand, covered with edgy tiny shells; maybe it hasn’t been used much recently. DM restaurant surprises us in a very positive way: The service is of high standard, and the cooking (bass cooked in a foil) truly excellent. Quite reasonable too, especially when considering they offer a free mooring with even mains power available. A starry and completely calm night follows; just the moon, the quayside lights, and Veli Rat lighthouse flashing in the distance. Moored on the jetty of DM restaurant in Cuna cove. Start of another sunny hot day; we want to use it for swimming and sunbathing, mooring on a buoy in beautiful Pantera bay just outside. 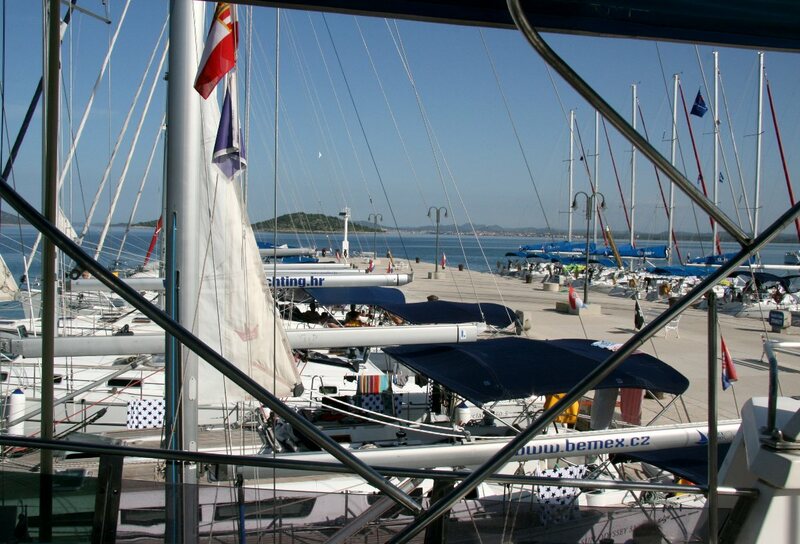 The weather forecast for the following night is for some wind maybe a little rain, so we leave in the afternoon and head for Zadar, where we choose the (expensive) town marina. 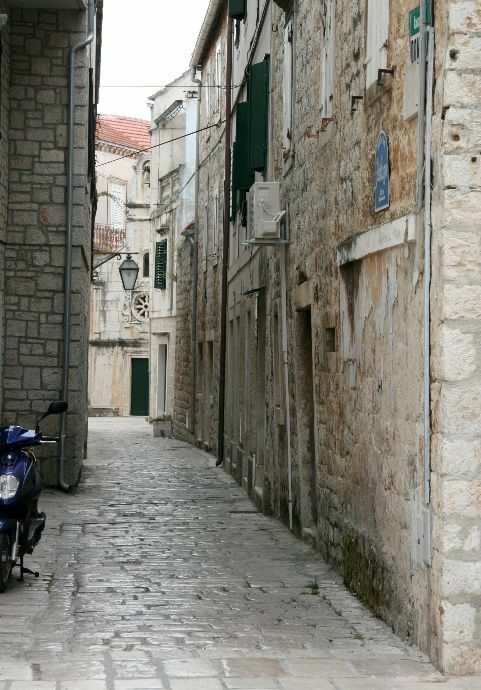 We have a stroll through Zadar Old Town, where there appear to be many locals but not as many tourists. It seems more difficult to find a nice restaurant for al-fresco dining here than in one of the small island harbours! We have dinner in a restaurant with tables outside in one of the squares; followed by coffees in a cafe overlooking the bridge to the Old Town. Leaving Cuna cove through its marked channel - seems to get narrower every time. Veli Rat marina to left. There has been slight rain over night, but the morning is clear and getting hot quickly, with an increasing SE breeze. We stock up in in a small food shop nearby and leave the marina around 11:00 heading for the anchorage near the Zdrelac passage. We notice that there very few boats here; there is a range of yellow buoys on W side and we decide to take one of them: It is now that this year’s minor drama happens, to remind us that boating is an “adventure” holiday: The buoy turns out to have an awkwardly small ring on top, in which our boat hook jams while the fresh breeze pushes the bow over the buoy swiftly. “No hook any more” PK announces stoically, then dives off the bow to rescue the elusive boat hook. Dropping an anchor in this spot does not seem an option to me due to the presence of the field of buoys, and rocky looking ground. To get PK back on board Jane takes the helm to keep the boat in position whilst I launch the dinghy and get the bathing ladder down. It’s amazing how long such a procedure takes when you try to be fast! We then let the wind push the boat towards PK who is clinging to her buoy; as soon as close enough she gets aboard using the bathing ladder; after that, we catch a buoy just floating past, from the bathing platform. From there, adjusting ropes and mooring properly is a matter of routine. Back to normal, that means lunch and swimming! Our plan had been to pass the Zdrelac passage and head for Iz. However, there are work boats and cranes around the passage (apparently engaged in widening it), and the passage is closed for traffic. We turn back and proceed SE through the Pasmanski kanal until the ferry port of Tkon on Pasman. On the W jetty about 20 new berths for yacht have been created with moorings, but there are only few boats and no people around. We go alongside the half finished quay, and make fast in an NW (off-land) breeze. There is even electricity available; but no one turns up and asks for money. 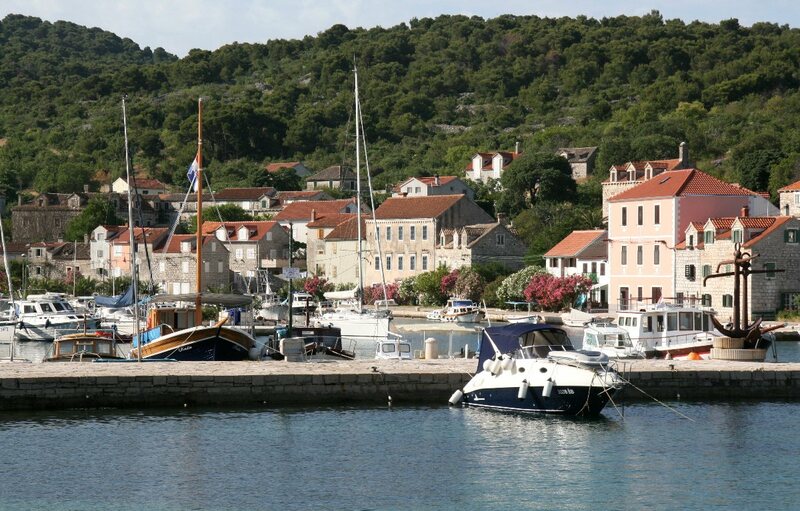 Tkon appears to be a simple fishing village and ferry port, but there are several konobas and cafes, maybe because it’s a short hop across the channel from Biograd, a main tourist resort. 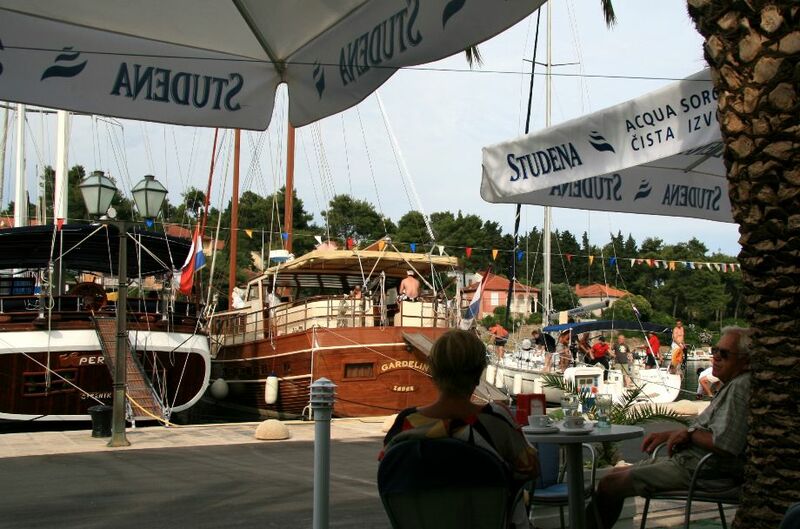 We have nice dinner al fresco at Aquarium restaurant, directly on the water with views across to Biograd. 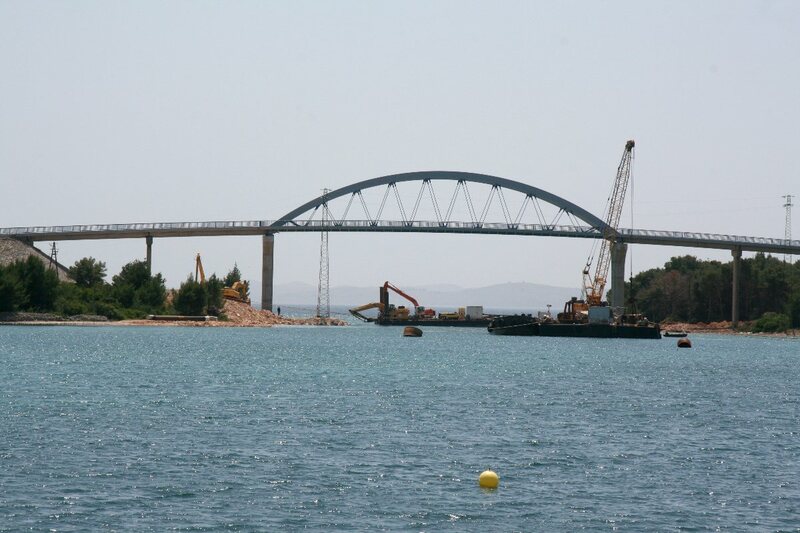 This passage between Ugljan and Pasman islands, under a road bride, gives access to Iz, Dugi Otok and the Cornati from Zadar. Zdrelac passage closed for widening works in June 2010. Sunshine cruise from Tkon along the Pasman coast to SE. 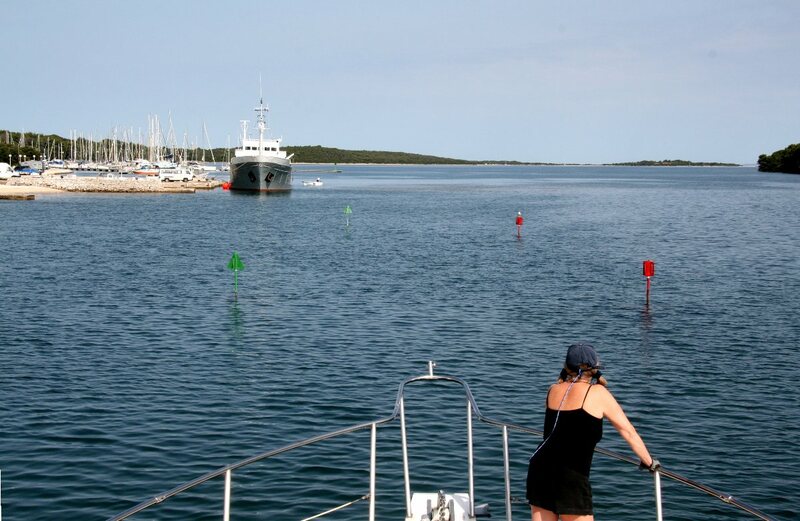 For the first time we note a busy anchorage (the small bay Zaklopatica), where all four buoys are taken, so we go to nearby Triluke bay, round the S end of Pasman, for a swim. We notice the presence of numerous gulls at the tip of the cove, and realize that there is a waste dump site on the slope above the bay (who can be careless enough to do this right there?). Anyhow, with on-shore wind and being anchored far enough outside, it does not affect us today. After a swim we venture on to Vragada. The fish farms between Vrgada and Murvenjak take a substantial amount of surface space; they seem to have grown; yellow markers with crosses on top deny access respectively passage. 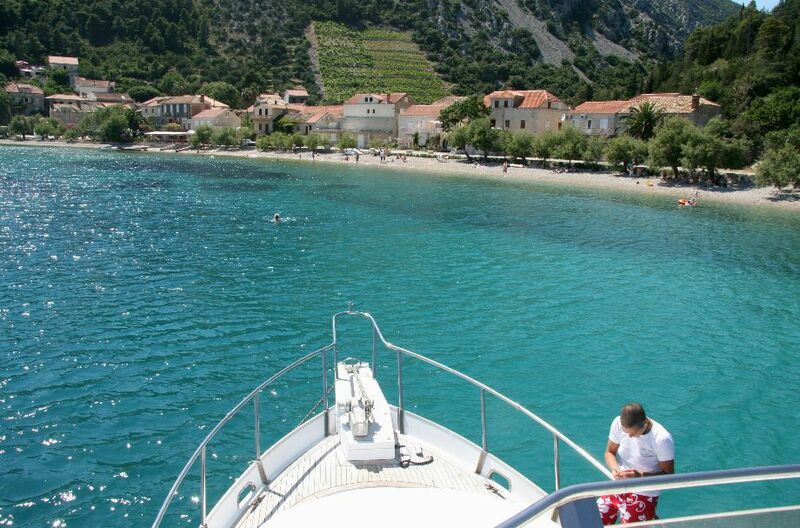 The bay on the S end of Vrgada, Kranje, is a popular and fine day anchorage; we have lunch and another swim. The Bstaendig guide mentions a nearby camping site but there are no signs of it at the time. We notice more yachts than in the earlier anchorages, we seem to have finally reached yacht tourism territory. 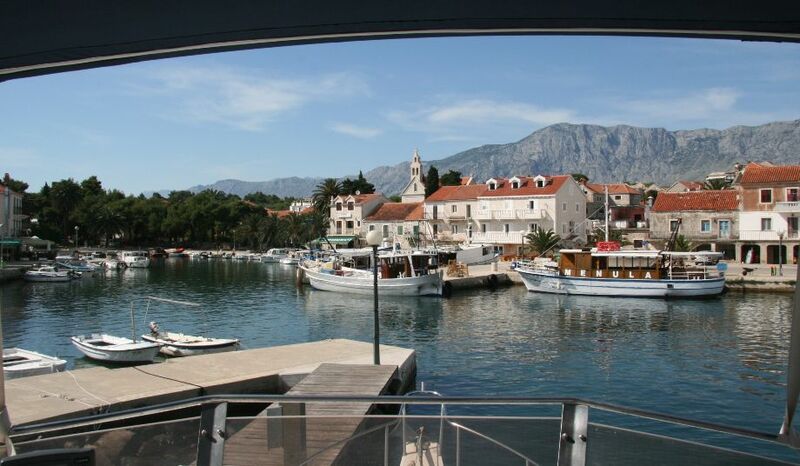 At 15:00 we leave for Zlarin harbour. The weather is very hot, we estimate it must be 30 deg C.
The guide described Zlarin as a nice village, and it certainly looks picturesque. Unfortunately we come across a harbour master who has his very own plans where we should berth, and changes them in the course of our berthing manoeuvre! He does not appear to have a good judgement of how to handle heavier boats in on-shore winds; by trying to accommodate his intentions I pull my right arm badly hauling in a tough mooring. This guy has no knowledge of languages either, apart from proudly shouting the amount of mooring fee he's charging in Italian. I am getting very annoyed with his poor performance, but this does not help the crew morale. Anyhow, we recover swiftly. 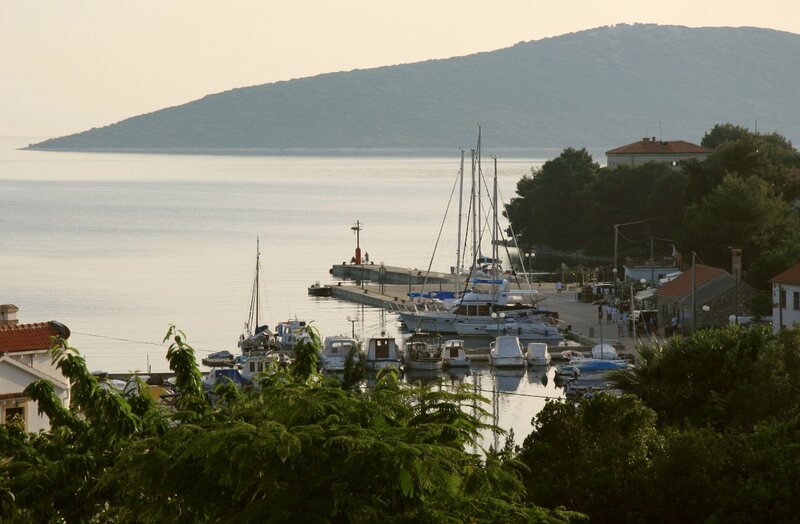 We are unable to spot any toilet or shower facilities for "Zlarin Yacht Club" guests; but the village has about 4 restaurants and a couple of cafes. We have dinner in Konoba Aldura, directly overlooking the quay, it's ok. The moorings on the main quay are plenty but exposed to swell from NW and from passing yachts. There are many yachts here tonight, several with Austrian crews; we are the only motor boat on the quay. By midnight the noises have settled down, the night is starry, and the outlook from the end of the quay across the bay and to Prvic is nice. 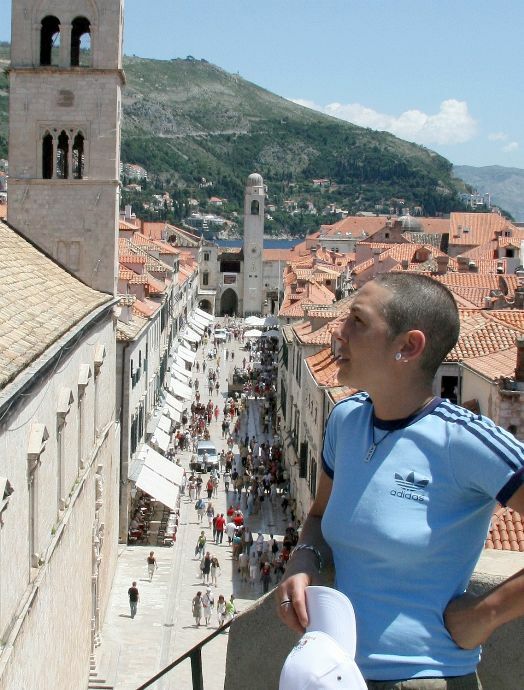 Nudism has a long tradition in Croatia respectively former Yugoslavia. The approach to Zlarin is straight forward. The main quay for yachts is sticking out in front, with the church seen behind. Inner harbour moorings may be less exposed to NW swell. 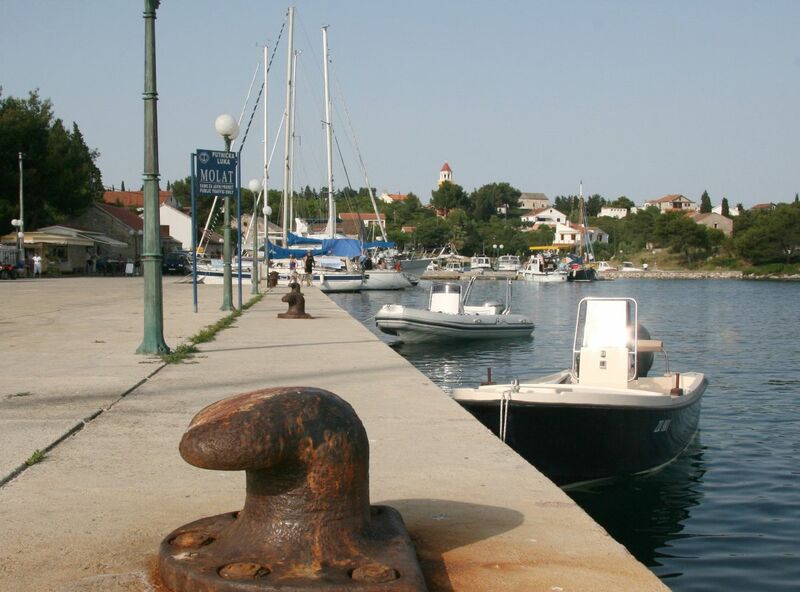 Moored at Zlarin's main yacht pier. Prvic can be seen across the water. It’s the final day of this cruise; the sun is bright in the morning but the forecast has been for slightly cooler and cloudy weather with light W wind due to a low pressure area deepening. From Zlarin we head to a bay SE of Zmajan, which is good for a swim. The sky is getting grey. 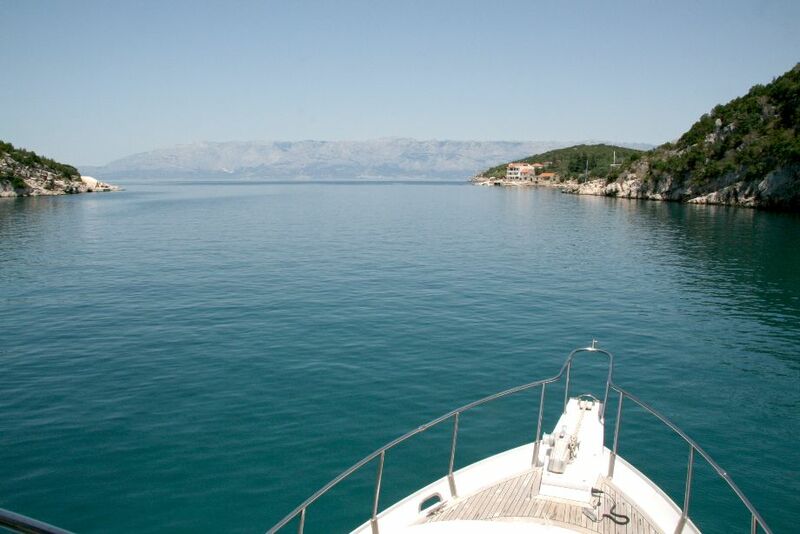 For lunch we choose to anchor in a different bay, Mala Stupica on Zirje, before setting course back to our charter marina. We anchor in the N tip of Mala Stupica which is a nice swimming cove - but missing the sun we do not feel like swimming today. The S end is occupied by fishing nets. A couple of sailing yachts are mooring here with landlines. Around 15:30 we weigh anchor and make our way back to Kremik; the weather is brightening up and upon our arrival the sun reappears. It’s time for re-fuelling and doing the usual paperwork with Offshore Boote. This evening we take the shuttle bus to Primosten and have dinner at Staro Selo; Jane’s favourite fish, skarpina (dragon fish), is available and tastes as delicious as we remember it. For the night we stay on the boat but will vacate it Saturday morning. Back at our charter base at Kremik. We have safely completed our cruise. Day out in Primosten which is a picturesque and friendly holiday resort; taxi to Split and flight back to London Gatwick in the evening. We were very lucky with this year’s turn of 10 days; mostly sunny days, very hot for mid June, and no storms or rain. 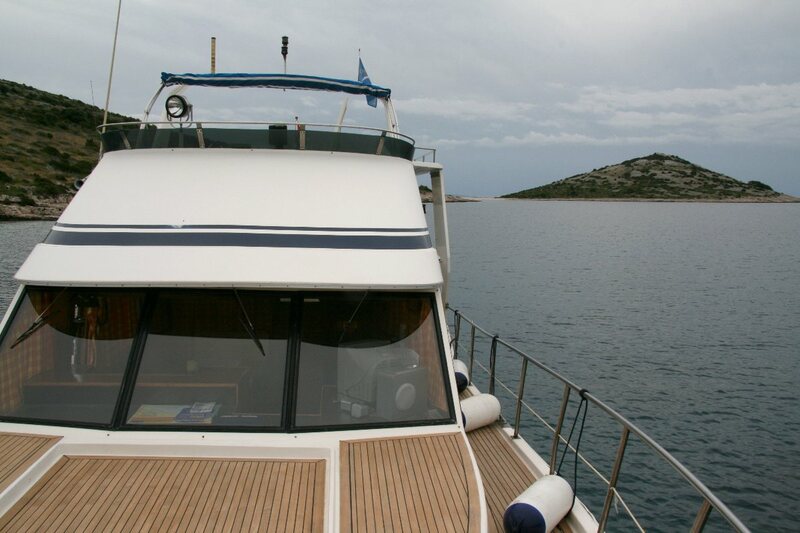 Blue Star, our 15m (50ft) aft cabin semi-displacement 'trawler style' motor yacht, although an older model, proved comfortable and performed to expectation. It offered lots of space and relaxed cruising at 9-10 kn with very good fuel economy. At semi-displacement speeds, however, the engines produced increasingly unpleasant noise and vibrations, so we didn’t open the throttles much. We did not experience any mechanical breakdown. We found that this year’s yachting season in Dalmatia was starting late, we encountered very few boats cruising, mostly sailboats, and few people in restaurants. It might be an effect of the low economy; however, for us the lack of crowds was welcome and reminded me of cruises nine or ten years earlier. 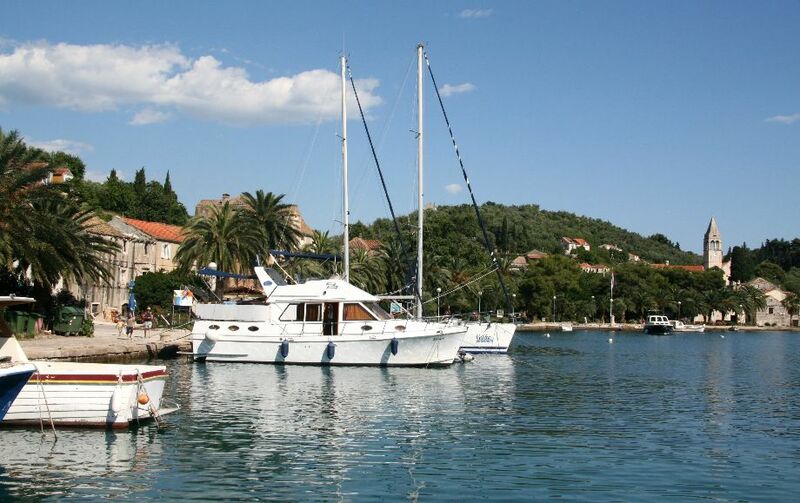 Croatia slowly moves towards more regulations, more organized and/or charged for moorings, and even higher prices in restaurants; but one can still find good value for money and extremely pleasing cruising grounds. Payments in restaurants, harbours and shops are usually only accepted in cash, Kn or Euro. Credit cards are accepted in marinas and large tourist resorts. Numerous cash machines are available, even in smaller villages; but some have limits of how much they dispense (2000Kn should work). Who says sail boats should all be white or blue? 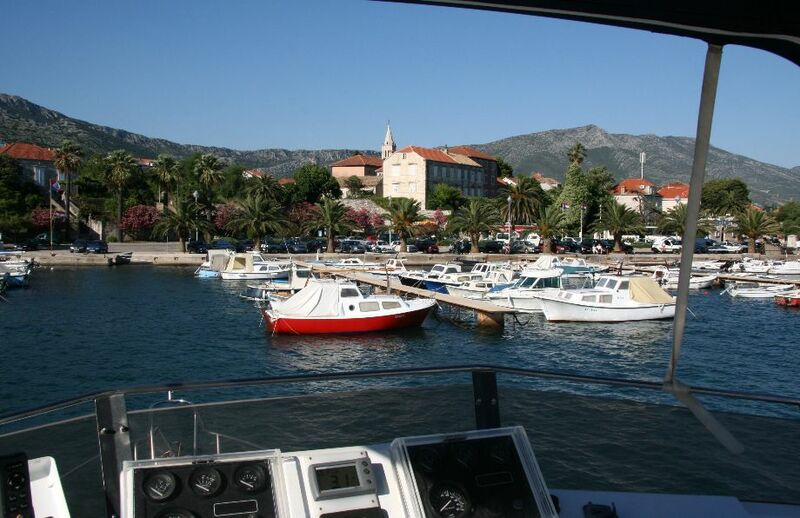 ITINERARY Marina Kremik/Primosten - Milna (Brac island) - Bol - Starigrad (Hvar island) - Lovcisce (Scedro island) - Korcula town (Korcula island) - Soline/Sv Clement (Hvar archipelago) - Palmizana marina - Hvar town - Milna - Necujam bay (Solta island) - Primosten - Kremik. I have read a favourable report about an Austrian motor boat charter company who offers a 34 feet twin diesel engines sports cruiser, which is a similar specification to my own boat in England at that time. Unfortunately the boat isn't available in the week we want to book, and I am not willing to go for one of their larger and more expensive fly-bridge yachts, which I consider to be oversized for us two. 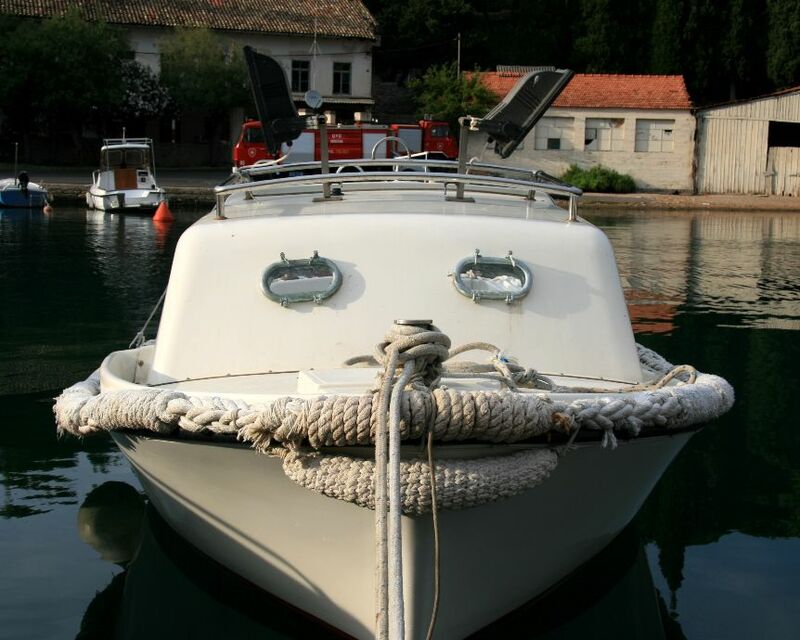 They refer us to an operator in the same marina, Kremik, who has a smaller and cheaper motor boat available. I agree to go for it; but I am soon going to learn that the rules here are not different from elsewhere: You get what you pay for, and, that bargain might not be what you had been dreaming of. 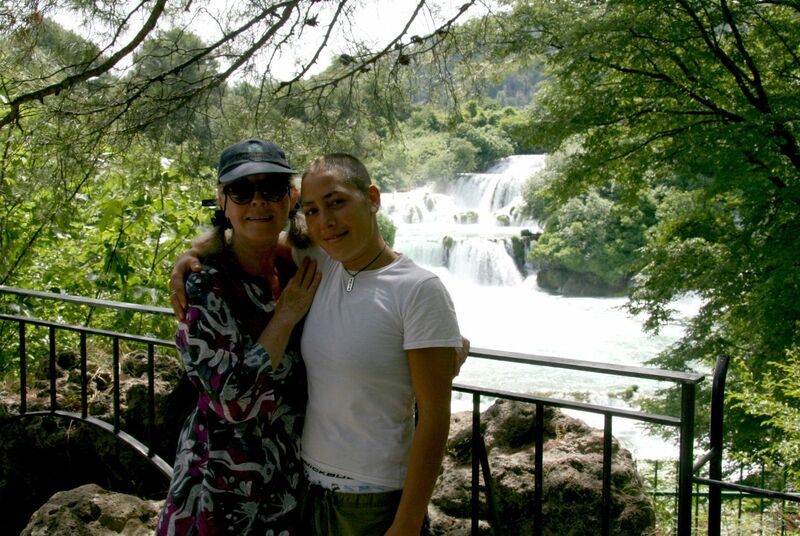 Anyhow, during this first Croatia trip we are getting amazed and charmed as we visit the nicest places with complete ease and relaxation in glorious weather. 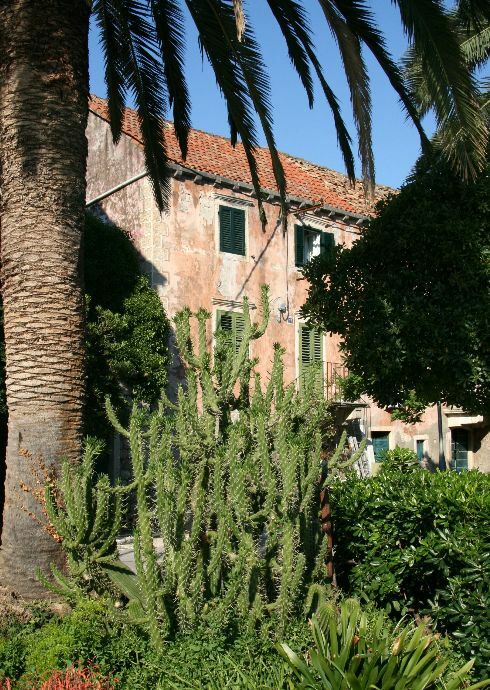 If the last sentence sounds like the 'Golden Old Days', that is indeed intended: Back in the early 2000s was a perfect time to explore coastal Croatia. 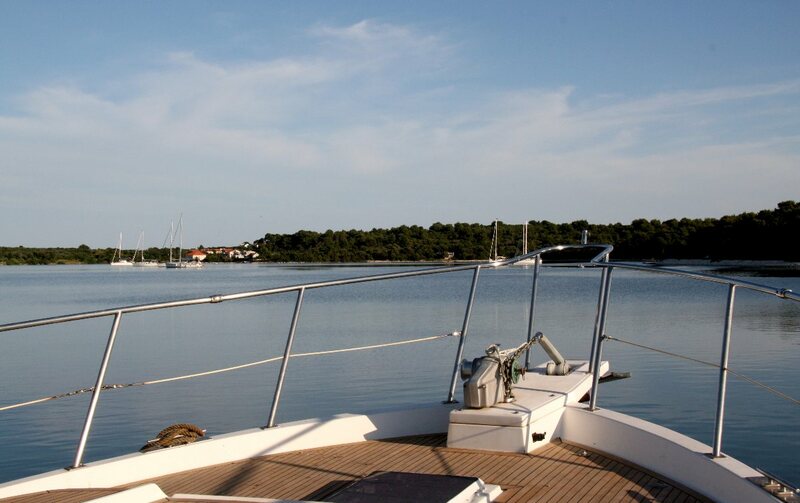 * All of Croatia's unique and pristine features were on offer, a full nautical infrastructure was available and welcoming the yachtsmen. All that nature, history and hospitality have to offer, was there, and all under the sun without any crowds. That's as close as you can get to boaters' paradise. * None of the horrid developments in the wake of aggressive tourism increase however, which we have to suffer nowadays, such as oversized charter fleets, inconsiderateness and hooliganism of charter crews, crowded harbours and marinas, disruptive mass flotillas run by internet holiday operators, year on year price hikes, new charges and excessive fees, none of those developments were even thinkable in 2000. Our Croatian Airlines flight from Heathrow to Split scheduled for 4.40 pm is not ready due to problems with BA's main computer system. Already on the airport, we turn back home, and later, after struggling to get up to date information, get to the airport at 10pm. The flight finally takes off by 11:30 pm and arrives at Split at 3 am local time on Sunday! Luckily, our taxi driver at Split has been monitoring flight arrivals and is spot on to greet us even at this unearthly hour; we arrive at the Kremik marina 3:45 am, find our boat “My Silvi”, and finally go to sleep at 5am. M/Y Silvi is an older Sea Ray 268 sports cruiser with twin petrol engines. It looks a bit tired and its green hull has faded in the sun, but in one outstanding feature this craft can rival any gin palace: Its sheer number of cup holders dotted all around the deck. Sunday June 18th. First day, and more difficulties. We have a late start to recover from the travel stress. Sort out paper work and try to get the food shopping done. Part of our list is still missing but by that time the store is closed and will reopen Monday morning..
Next step is to familiarise ourselves properly with the great grand motor yacht. Weather seems to get a bit windy, and outside at sea white horses are seen. Yes, confirms our charter guy, when wind gets up like this the sea is "no place for small boats, they quickly huddle up in harbour. Only big guys can still go". Listening to the wise man we decide to stay in the marina this night, and to get all necessary shopping done next morning, and start from there. Later in the afternoon we check My Silvi out and find that the controls on one of the engines are tricky; the engine cuts out when changing gear from forward to neutral or reverse. Having experienced awry mooring manoeuvres myself, I am very worried what might be coming towards me. I ask the owner/charter operator, he is unable to sort out the problem but promises a mechanic friend will be available Monday morning. We have a pleasant dinner at the Kremik marina restaurant. Mon June 19th. First day at sea, finally. 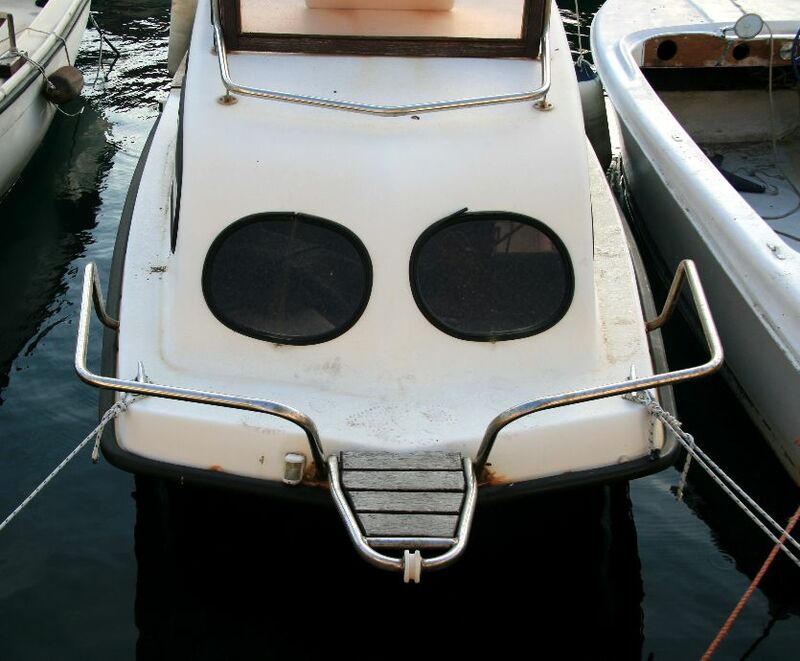 Unfortunately the gear/throttle problem cannot be resolved, so I ask if there is a replacement boat available; we are offered "Red Lobster", a similar sized Bayliner (2755), of a friend of his. It is a planing boat as well, but with a single large Mercruiser petrol engine; it needs to be prepared first, they say. A single engine is of course not ideal, but its different layout offers sufficient space for us both, and it looks a little newer, so I agree. Finally, we set off at lunch time. 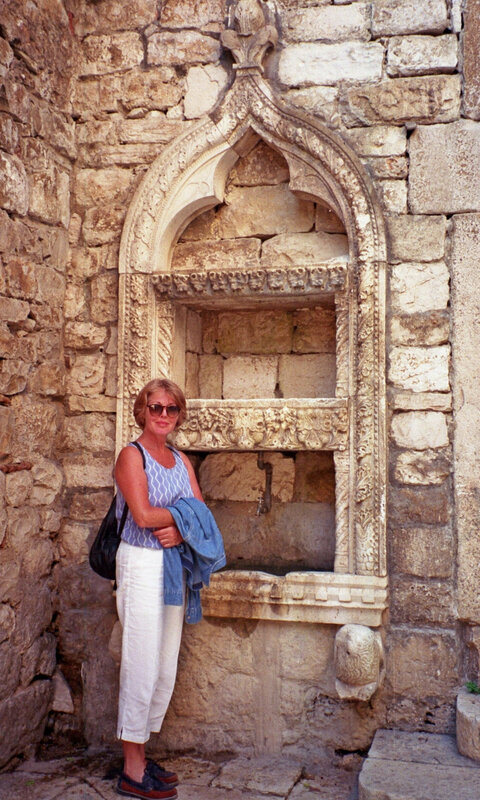 Jane has bought us the brand new Navigational Guide to the Adriatic, Croatian Coast (2000), in the English language and with nice photos and plenty of information. I believe it is the first guide of its kind in English, for an area which has so far mainly been covered by german and italian publications. 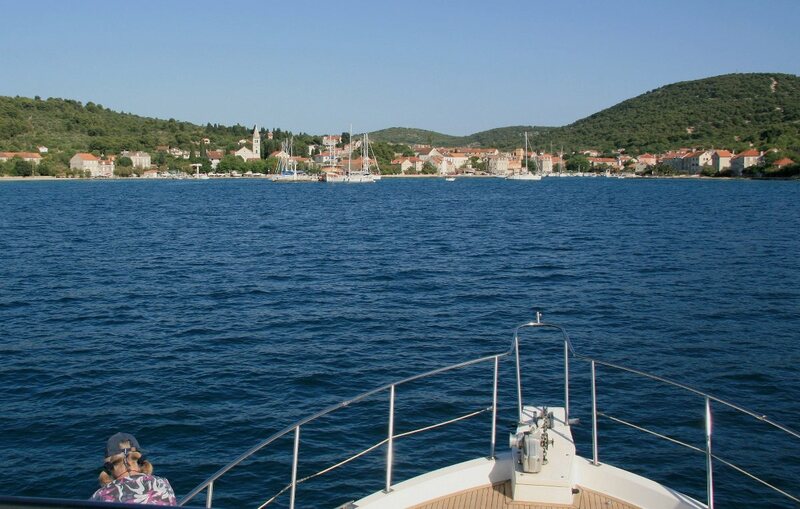 We set route for Milna harbour/marina on Brac. Some wind is coming from the west, but it is from the aft quarter and so our cruise is fine. On route we stop and anchor in a bay on Solta for a swim, which is great; but it appears that our anchor is not holding well. Soon we continue on the short leg to Milna (island Brac). By that time the boat's GPS has given up its ghost, so I can put my small hand held unit, which I brought with me, to good use. Mooring up in ACI marina Milna turns out to be a bit of an experience, due to an awkward to reach berth (at least that's what I think at the time!) with an unfamiliar single engined boat which shows a strong prop effect going astern. So, the manoeuvre takes us close to the moorings of local fishing boats. Add to this a shouting and gesticulating marinaio who cannot believe that there could be anyone on the water who is not an old hand at all aspects of their Mediterranean way of mooring. (That unpleasant practise of picking up and pulling the boat with a muddy slimy dripping rope which is fixed to the sea bed somewhere in the middle of the harbour). After tying up safely without having done any damage we relax with a drink and enjoy the lovely and picturesque old fishing harbour of Milna with its excellent new marina. 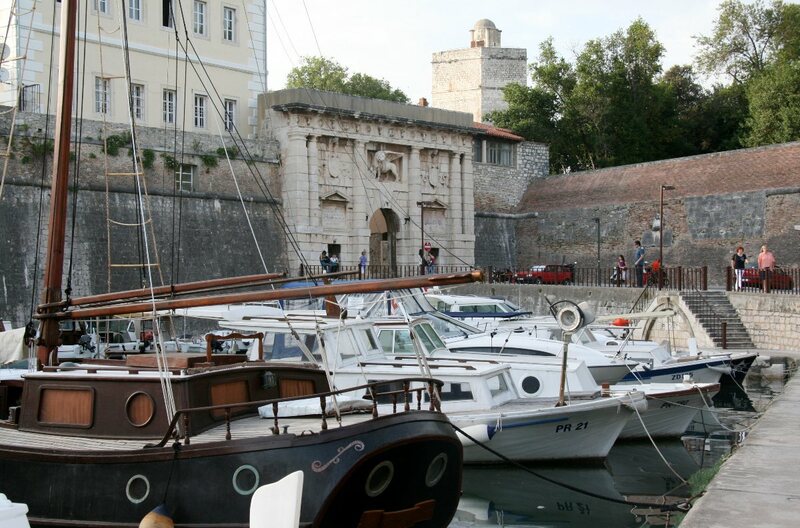 Milna ACI marina in old town. Red Lobster is the small sports cruiser on the pier to left, with a blue stripe on the gunwale. Jane logs "I think the main problem is this strange method of mooring stern to shore with a light pick up rope on a bigger mooring rope and chain in the front - very peculiar". Shortly later I decide to try starting the engine up again, just as a test. This doesn't go well; not only does the engine refuse to fire, the noise and bleeping sound in the tranquil atmosphere around us are quite annoying, so I decide to face the problem if it occurs again, on the next morning. We sit down for a wonderful fresh fish dinner in the old part of the harbour, in what can be only fairly described as a film set - just ancient and quaint, and without annoying signs of tourism as we find them in countries further west. We wonder about the economy and the level of income of the locals... anyhow, after several glasses of wine we amble back to the boat. Alarmingly (to those who think that in the “non-tidal Med" the sea level must be constant at all times…) the water, and with it the passarella, has dropped by about a foot - "we must say we hate those things", but get back on board and bed down for the night. Today is Jane's birthday but the self-absorbed distraught skipper appears to be oblivious to this most important date in the annual calender (!) … anyway, Jane waits patiently without saying anything. And, it's a wonderful morning in fabulous surroundings. Fishing boats depart around 2 to 3am, sailing yachts around 6am, and church bells authoritatively demand attention at 7am; a very nice looking very old church it is indeed, and has got very loud bells, too. We shower, have breakfast and are underway by 11:30 am. 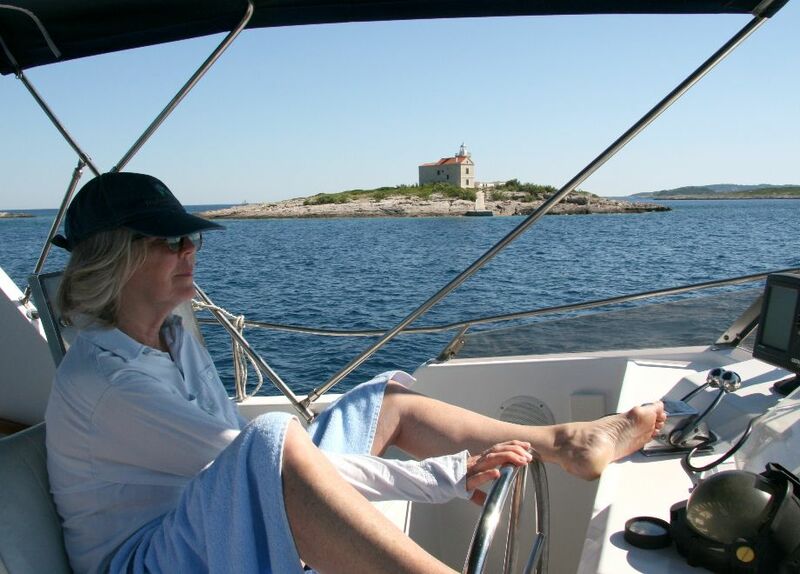 Jane has plotted the route along the South coast of Brac to visit Bol, and then on to a large anchor bay in the Starigradski canal, on the NW coast of Hvar, where we anchor successfully (on the 2nd attempt), and have some lunch. It is one of the arms of the Tiha cove. Time in the sunny afternoon is spent studying and rowing about in the dinghy, and sun bathing. 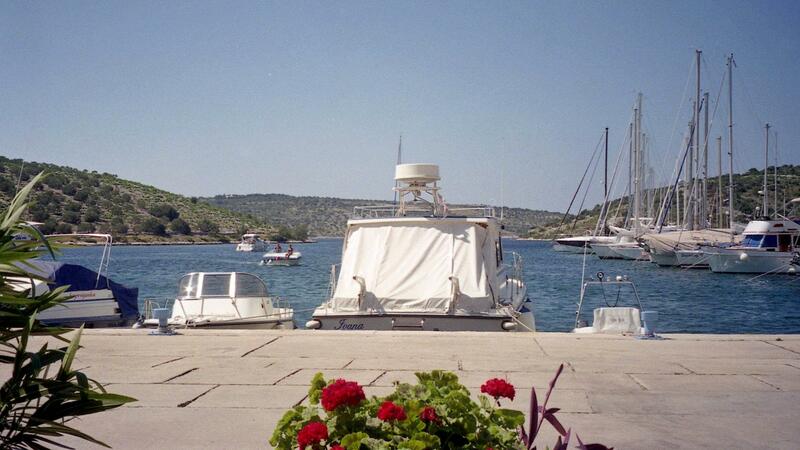 By 5 pm we feel ready to leave the lovely quiet bay and head for Palmizana marina/Hvar for the night. But fate is not with this plan of ours; we appear to have developed an engine problem; no way to get the monster up and running. Suspecting a mere carburettor flooding I wait a while and try again, but without luck. Call the owner, he suggests tricks we have already tried. 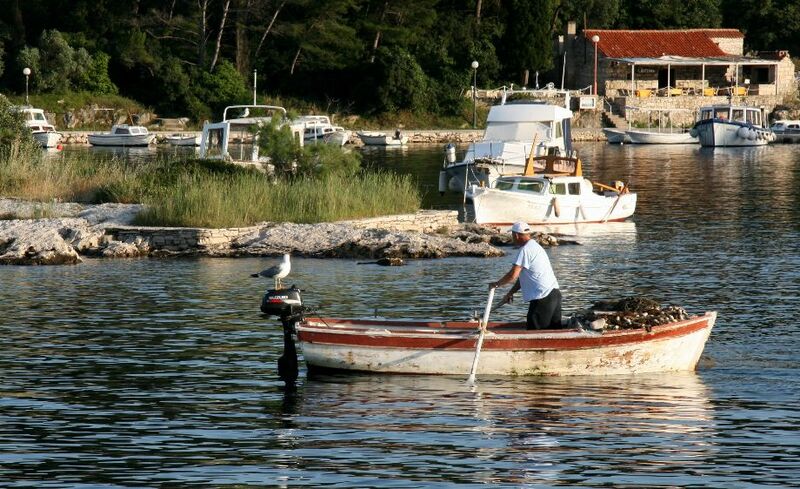 Final suggestion is to rig the dinghy's tiny outboard engine and try to slowly get to Starigrad, 3 miles away. No problem as the weather is calm and balmy. 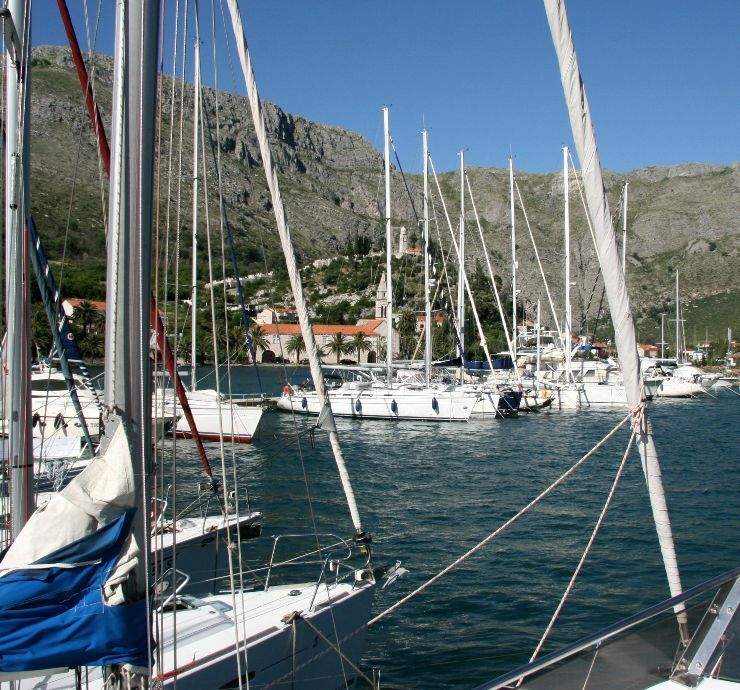 Anyhow, we are less than delighted, and ask the sailing yacht which is anchored next to us, whether they were going to Starigrad and maybe could give us a tow… they decline, explaining that they are anchored for the night. We get underway, probably making about 1kn. After only a short distance of struggling we see the yacht, called Moonraker, coming towards us to assist us - they must have watched us and taken pity. Excellent sailors and great people, thank goodness. Willi is of course furious with the owner to have let us get into this situation, probably through sloppy engine maintenance. Anyhow, we are towed to Starigrad, and the kind captain of Moonraker collects his tow line. We shout a big thanks and ask what we can give them in return; the answer is a bottle of gin would be welcome. They leave and we buy a bottle later, in the hope we may catch up with them soon. Powerless in a power boat we get roped along by some kind yachties and end up alongside the pier at the harbour entrance. Later on Willi tries the engine again, after a call from the owner giving another “trick“ to try and - guess what- it starts. Thank god we hadn't tried this in the presence of our selfless rescuers, what an embarrassment would this have been. The skipper is now in a slightly gloomy mood which is not helped by encouraging comments from Jane, who infers he may have forgotten her birthday … Anyhow, we have a lovely meal in a family run restaurant and, after all, finish Jane's birthday happily. Wed June 21st Towards the South and Korcula. After a good peaceful night we manage to slip away from the quay without paying any harbour dues; we had been moored next to some commercial craft, yachts usually go further inside to the yachting quay. The engine seems to be ok so there is no need for a mechanic. Once out of the Starigrad channel we discharge our holding tank which got full - I wonder whether that could have been all ours. 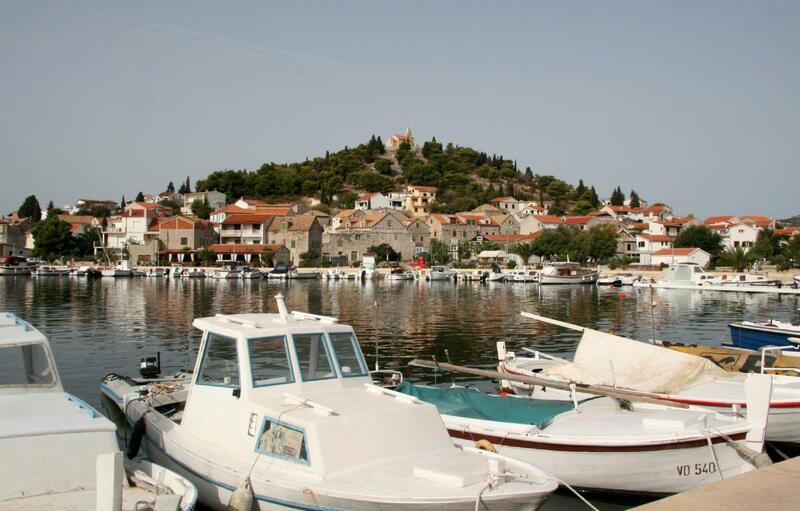 Head for Sveti Clement and Palmizana marina, and do a harbour tour in nearby Hvar town - really a nice old town and very nice harbour. 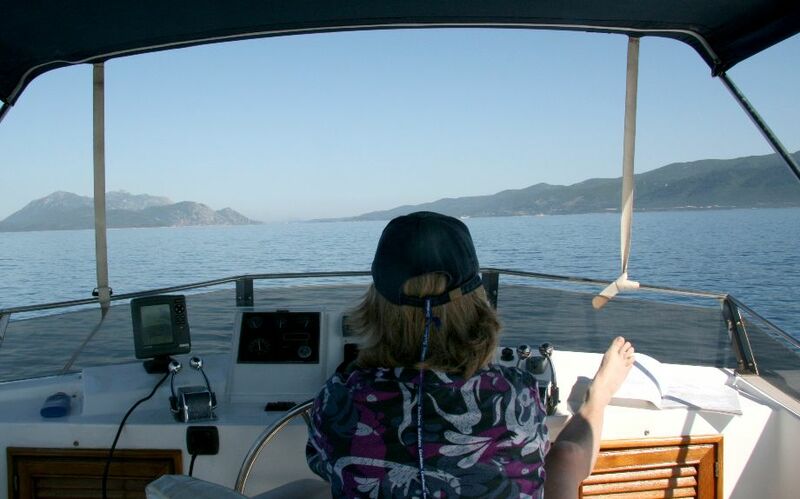 Seas are flat so we press on and have a smooth ride to Lovisce cove on Scedro island. Stop at anchor in SE bay, for a swim, then change to E bay and see a restaurant that had been mentioned in David’s log. 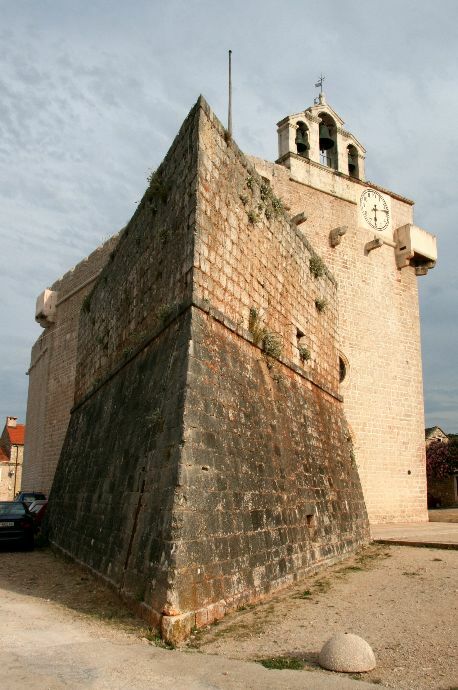 Leave and drive on through the Korcula channel and towards Korcula old town, with some SW wind in the channel. 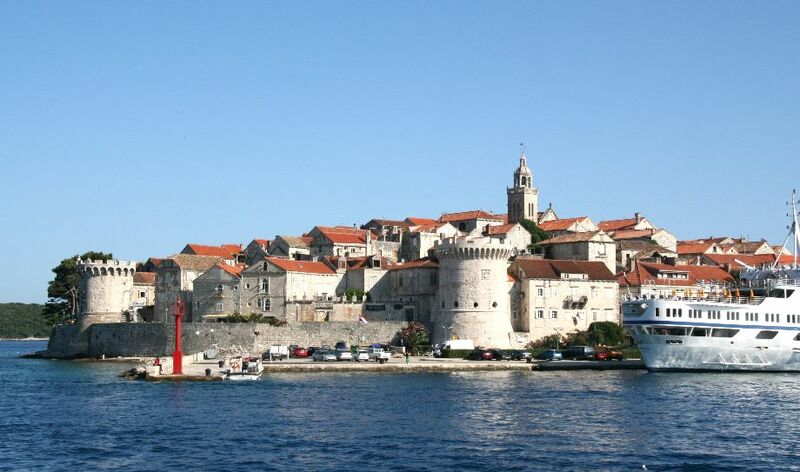 Approaching picturesque Korcula walled Old Town from the West on a sunny afternoon is a highlight for any mariner. Even more so, when it's your first time and you are practically the only boat around. 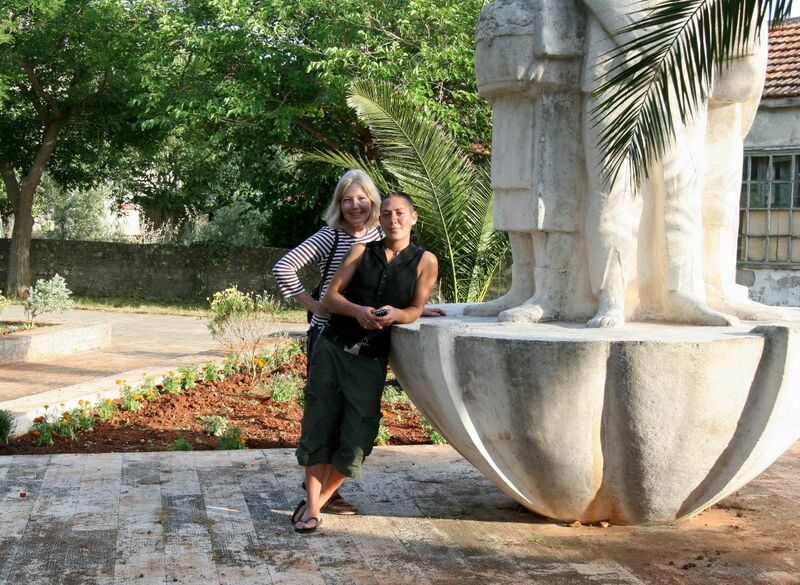 Moor up in Korcula town marina (ACI), east of old town, this time without any hiccups - happy bunnies! Have a drink on board, in very hot sun, before getting ready to explore the town before dinner. Lovely medieval Old Town, cleverly laid out to protect against the northerly bora but allowing the mild SW Mistral to waft through. After visiting the (purported) house of Marco Polo, the local hero, enjoying great views from the top, we have very good dinner at characterful restaurant Addio Mare. Have coffees and digestives in a quite grand looking hotel on the west harbour front, watching a beautiful sunset. Back on board for a candle lit nightcap and a good rest. Thursday June 22nd Time to start moving towards the base. 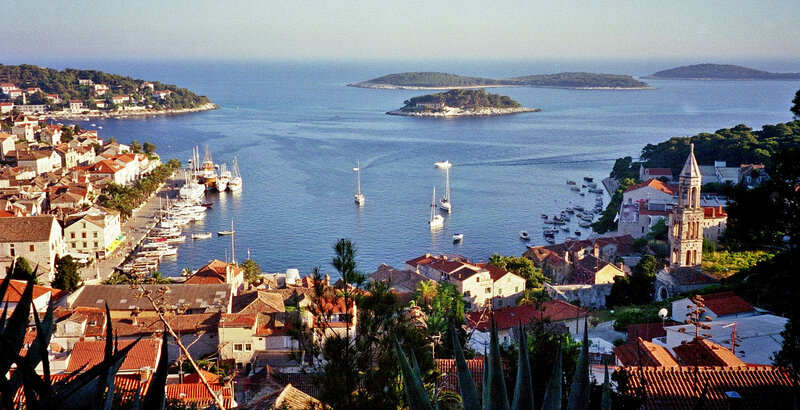 Hvar is the next highlight. Very quiet night (apart from noise from the fridge, so I ultimately switch it off). 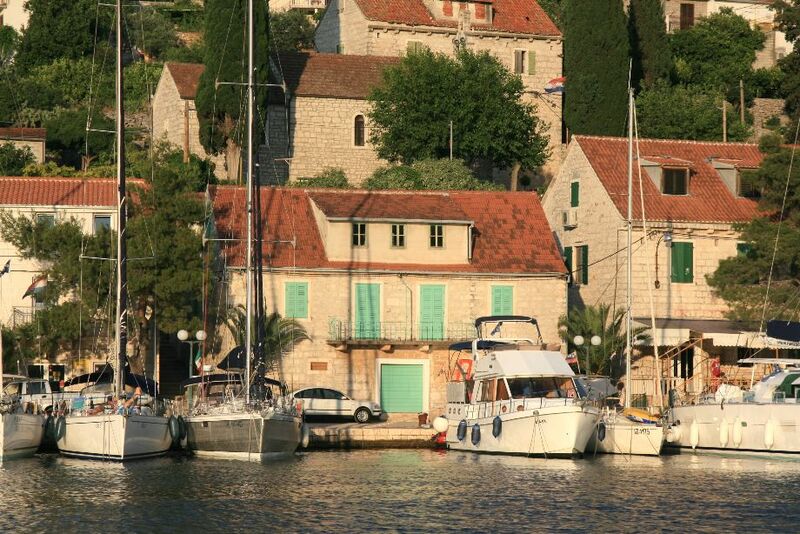 Our plan is to go to Palmizana marina at Hvar for the next night. 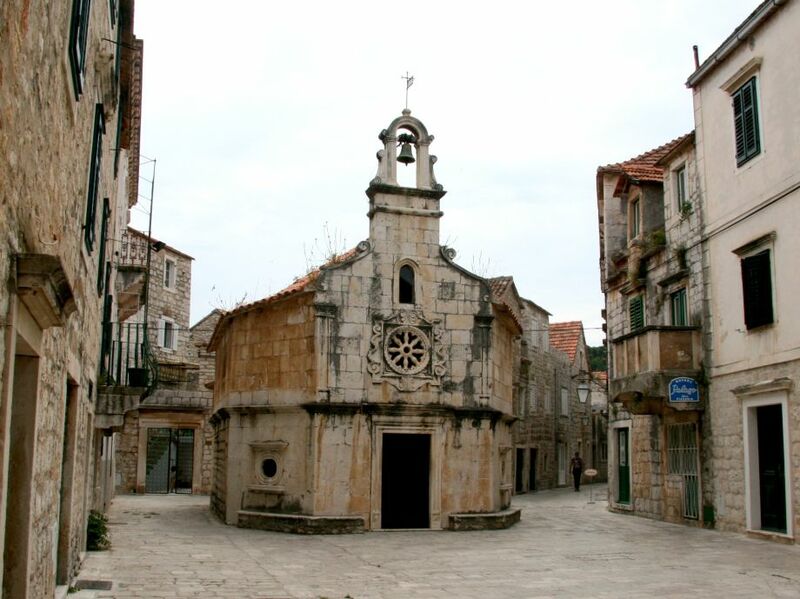 Leave by 9am, get to the petrol station and fill up, and view islands around Korcula town in passing, including Badija with its beautiful monastery. 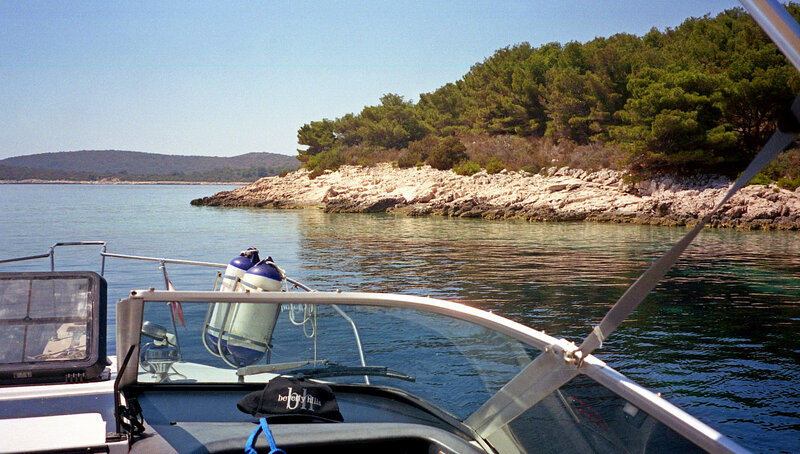 Then head towards Hvar town, but first to go to a bay. After 2 hours of motoring at 20 kn which is a bit boring and tiring due to engine noises, we reach Soline bay on S side of Sv Klement for lunch, and anchor successfully. Willi starts (already) being concerned about getting back to base on time, whilst Jane fully enjoys the pretty bay, its clear water, the wonderful sun and peace - just as one imagines paradise. Have a good swim and leave for Hvar at 3:30pm; have a look around the harbour, also look for the fuel station but fail to spot it (we hear later it's in a small side arm in the East of the harbour); moor up in Palmizana marina at 4pm - very clean water, children and dogs all swim in the marina. 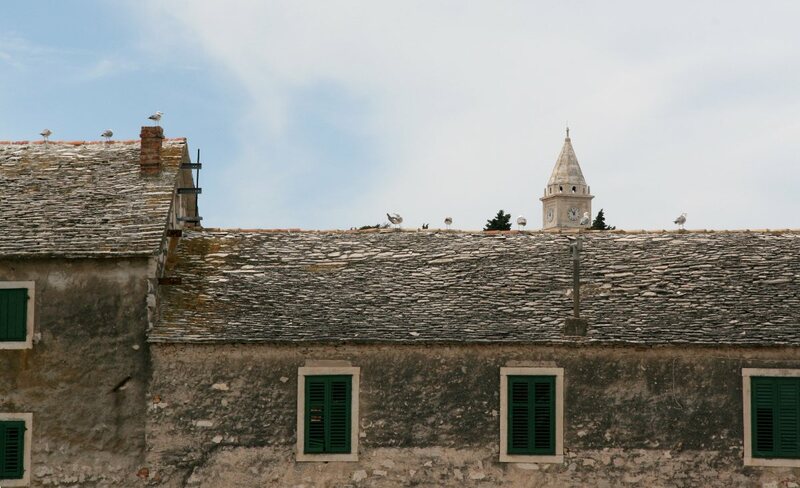 At 6pm take a taxi boat to Hvar old town. 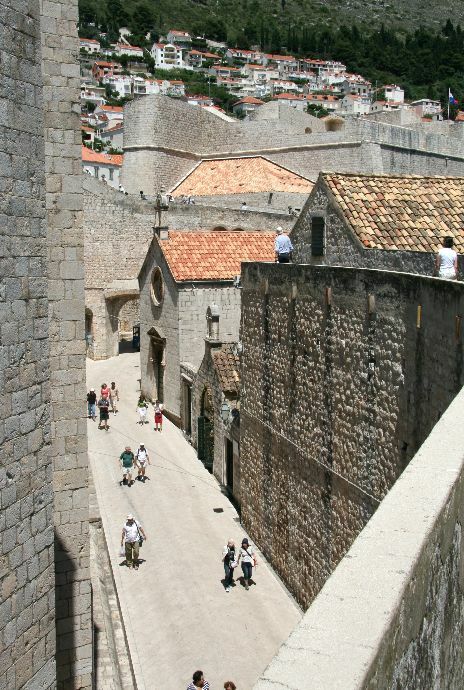 Walk to the top of the citadel for its stunning views, and explore the Old Town. 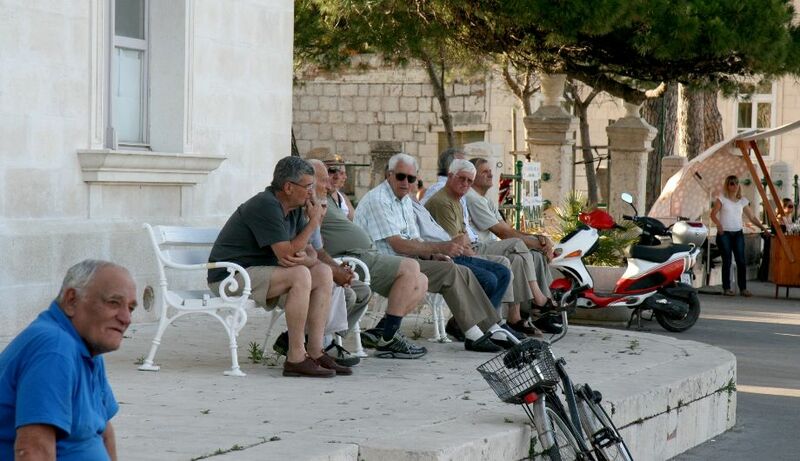 Nice sightseeing at Hvar town. 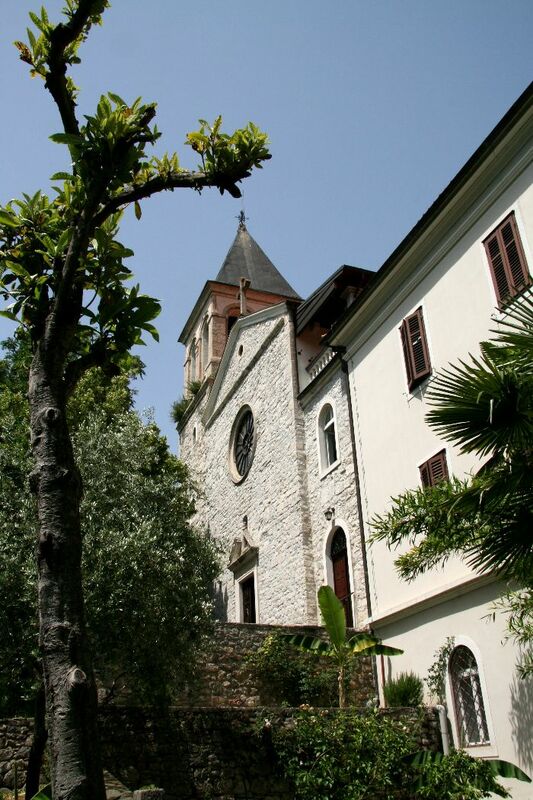 Franciscan monastery, above. Have excellent dinner and later stroll around the harbour, leave 10:30 pm back to the marina, the boat ride takes less than 20min. Next day is our final leg back to Kremik marina. Friday June 23rd Making best use of our final day at sea. Leave Palmizana at 8:45am towards Milna, refuel and leave Milna 9:45 am for Necujam bay on the N of Solta, only 8nm from Milna. Have lunch and a swim and leave at 1pm towards Kremik. 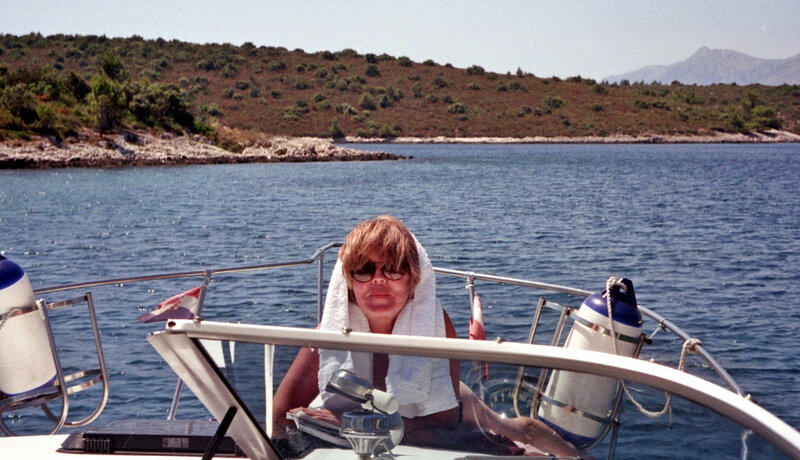 Taking a slow ride whilst leaving Drvenik to port, Jane decides to ride on the bow and sunbathe - which she enjoys but gets sun burnt as the wind does not let one feel the real power of the sun. Enroute we take a brief look at Frapa marina and around Rogoznica bay - does not seem very notable really. Then make for Primosten and have enough time to anchor on the east side of the bay. Have a good swim and decide to bring mask and snorkel the next year to make use of the crystal clear water down to 10m depth. On the way back to Kremik, around 7pm, the sea state is flat, the smooth surface glittering eerily in the evening sun as if it was oil. 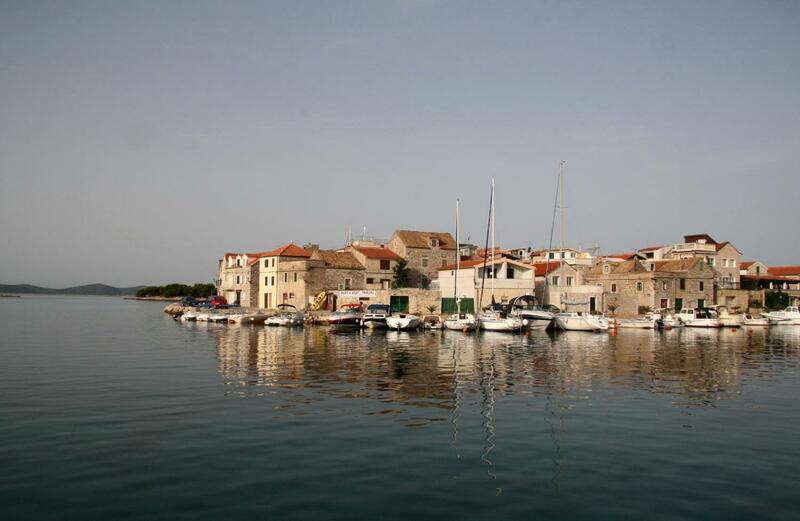 From marina Kremik we take a taxi to Primosten to explore the old town and have dinner on the harbour front, wonderful fresh fish in a restaurant called Staro Selo. Then walk to the hilltop and enjoy the fabulous view from the cemetery - blissful ancestors enjoying such views perpetually! We return to the marina and finish the day with a final drink by candle light. We are thankful to be back safely, despite a dodgy engine, and with only one minor loss - a towel had gone over board in deep water and been quicker to sink than the "man-over-board" manoeuvre to rescue it. Sat June 24th Returning home. Cloudy skies (first time in this week) and rumble of thunder at first but clear by 10:00 am. 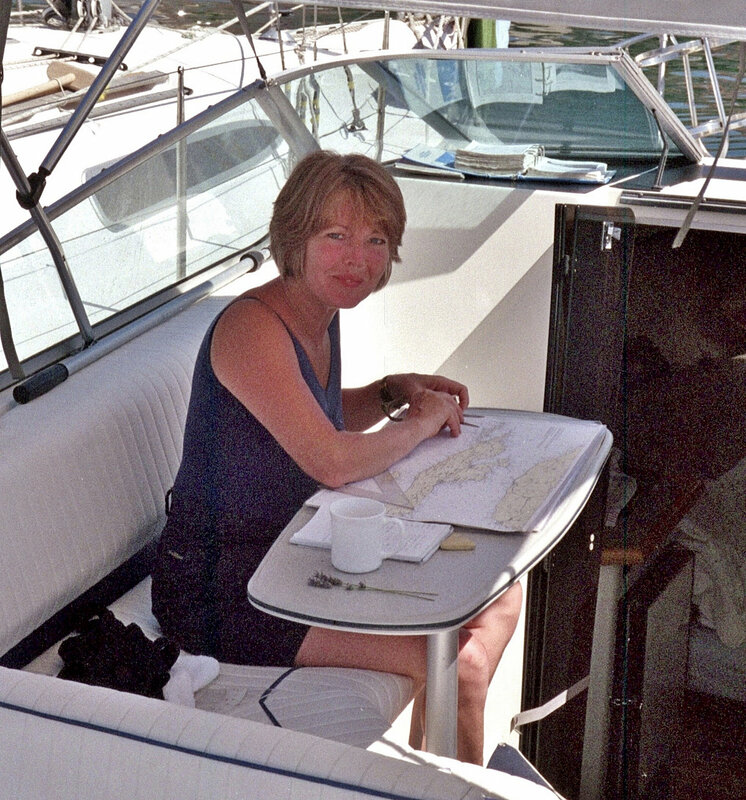 Have breakfast and nice not overly sweet pastries; refuel the boat and get ready to hand it back. Waiting for the taxi we notice again the presence of crickets and Mediterranean smells of pine and herbs that grow wild and are also cultivated throughout the islands, lavender, rosemary, thyme, marjoram. The food in restaurants has been very good, generally with fresh local produce used and a good level of sophistication. 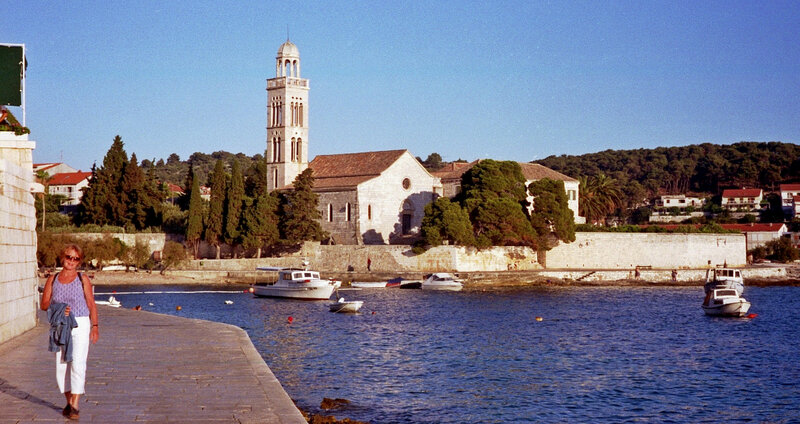 As we discuss what to do "next year" it transpires that this year's experience could mark the start of a series of similar holidays on the Croatian Adriatic sea.